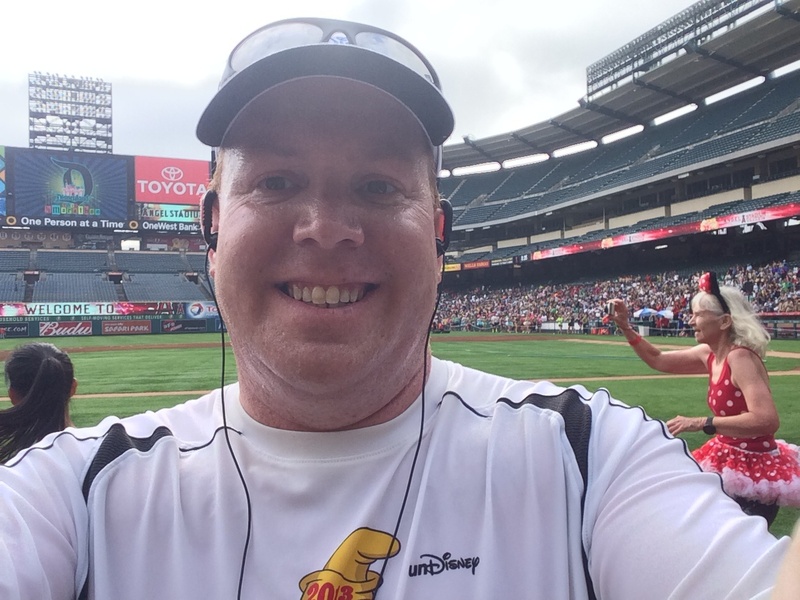 With the Disneyland 10K in the books, I had one last race to complete the Dumbo Double Dare…the half marathon. 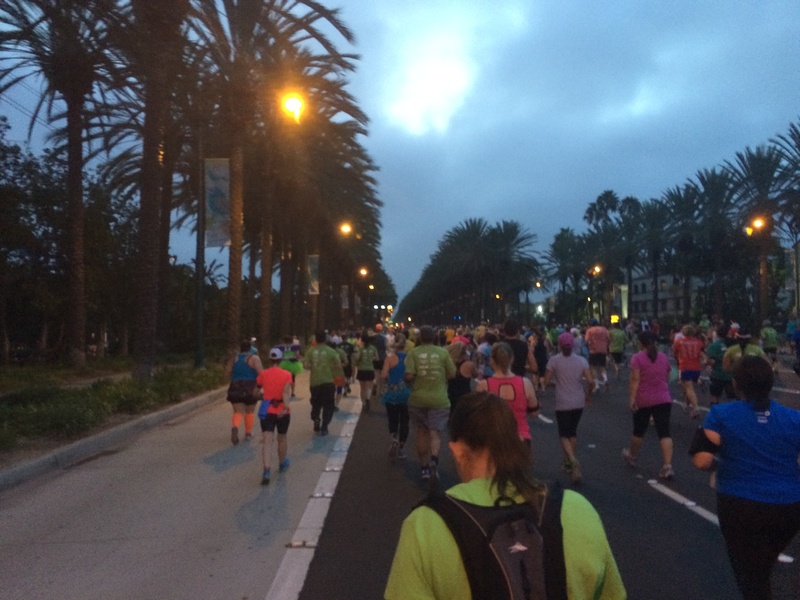 Waking up for this race was much more difficult than waking up for the 10K. 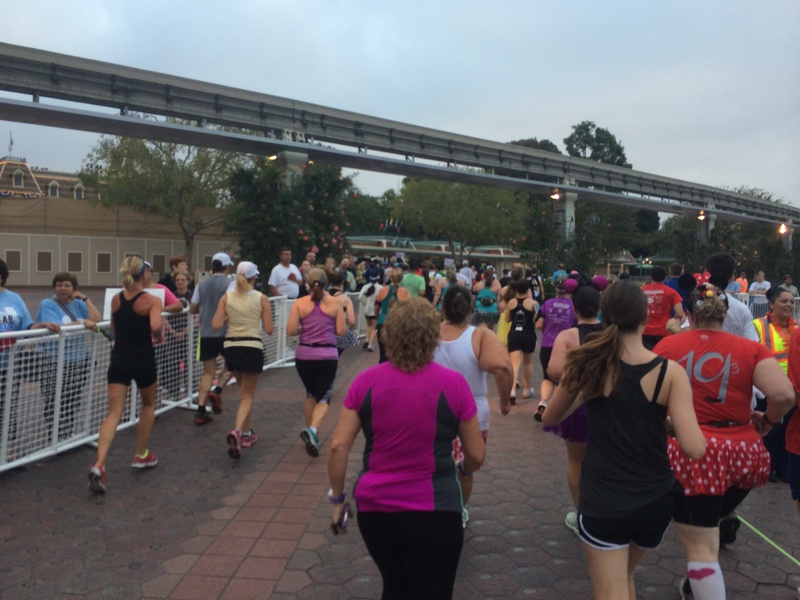 I was up and out the door with plenty of time to meet up with my fellow runDisney peeps! 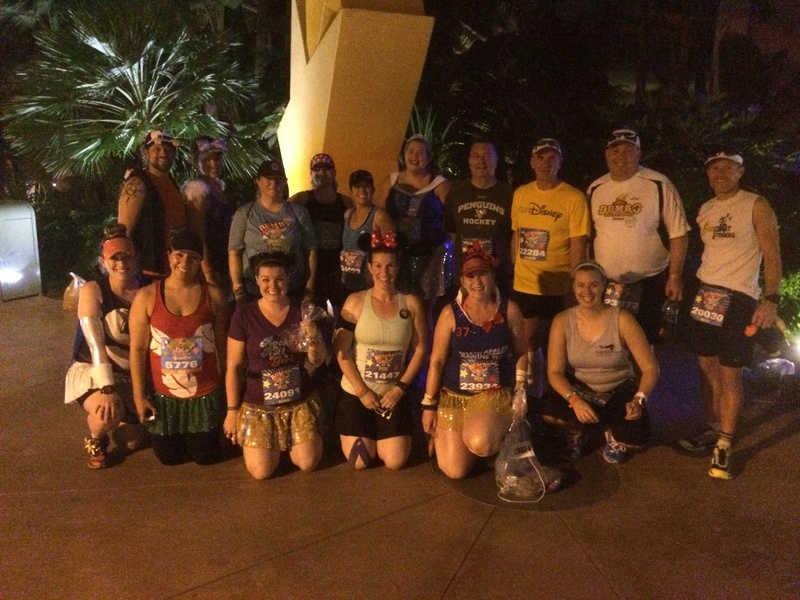 Above are the people who showed up for the Team #runDisney meet up before the Disneyland Half Marathon. Even though Juliana didn’t make the group photo, she showed up in time for me to see her again. 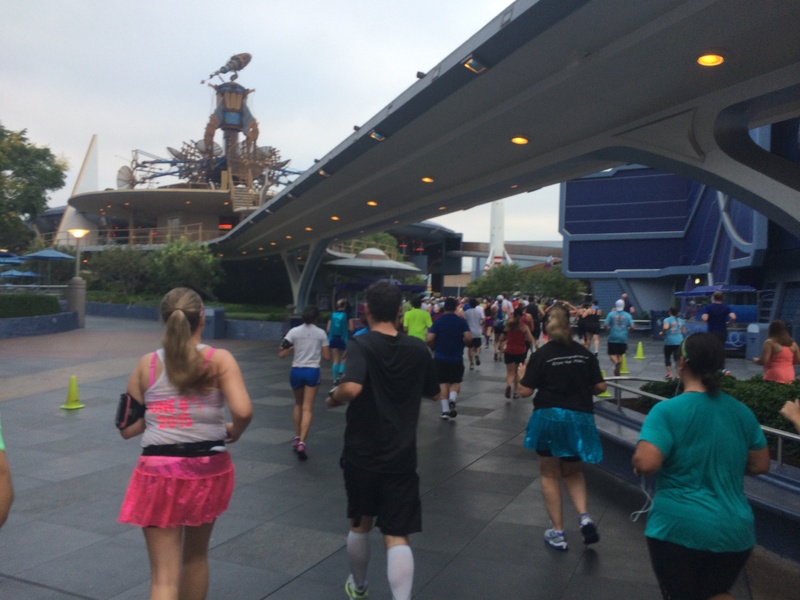 Also, I got go chat with Erica (my WDW Marathon pacer). We talked for a little bit after the group photo and decided to head off to the staging area. 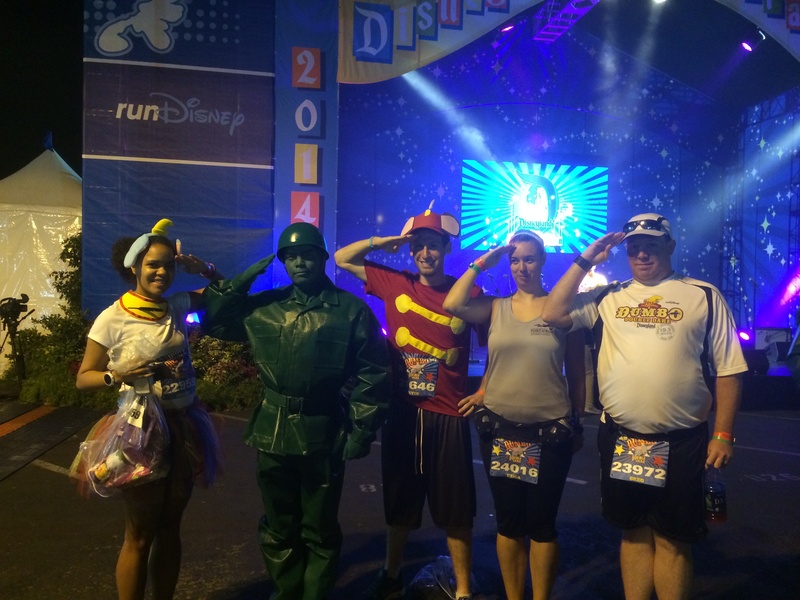 One thing I don’t think I’ve ever seen at a Disneyland runDisney race was characters. The Green Army Guys were out and we decided it would be fun to take advantage of a photo-op BEFORE the race! After bidding Juliana and her friend good luck with the race, Erica and I hung out for a bit because we weren’t ready to go into the corrals yet. Then, magic happened! 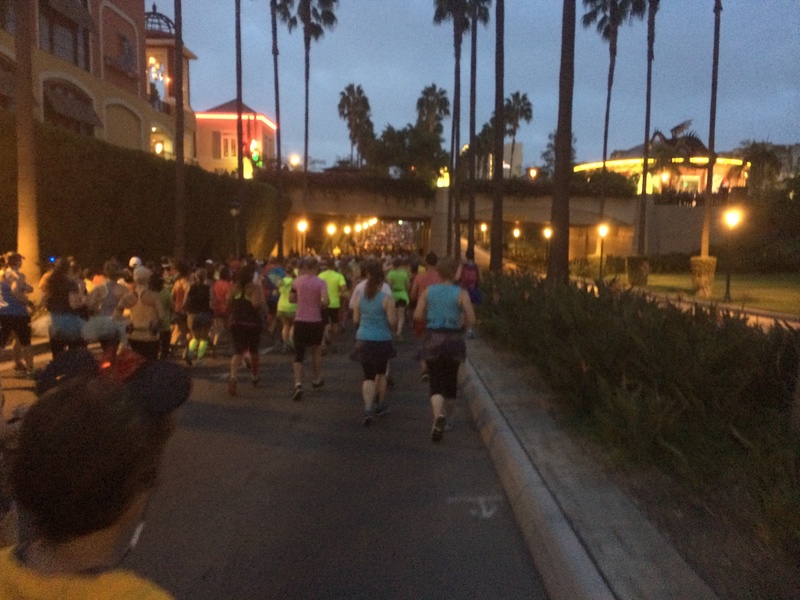 While we were chatting, a group of runners gathered in front of us for a group photo. I went to see what the group was and it turned out to be the Run 3rd group. This is a group that Sean Astin is apart of. He wasn’t in the picture. However, not too long after they took their picture, he walked up to where we were. He looked at Erica and myself and asked if we were together. I told him that we were friends. He said I needed to help Erica stretch out. I had no idea how to respond. So, he got down and showed me. After helping Erica out, I asked if we could get a quick picture. I know it came out a little blurry. 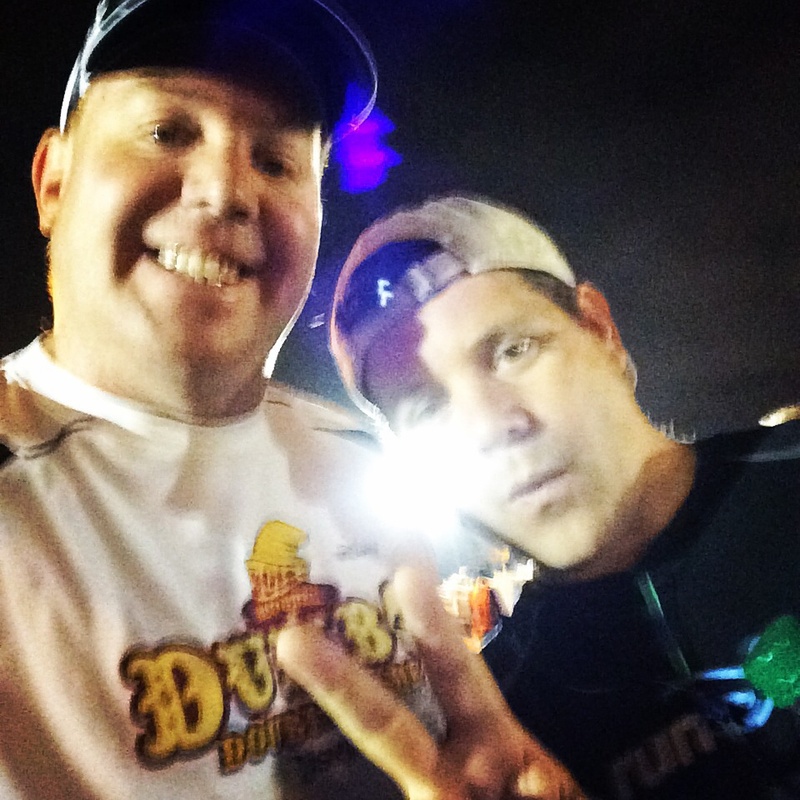 However, it’s my proof that I met Sean before the race. 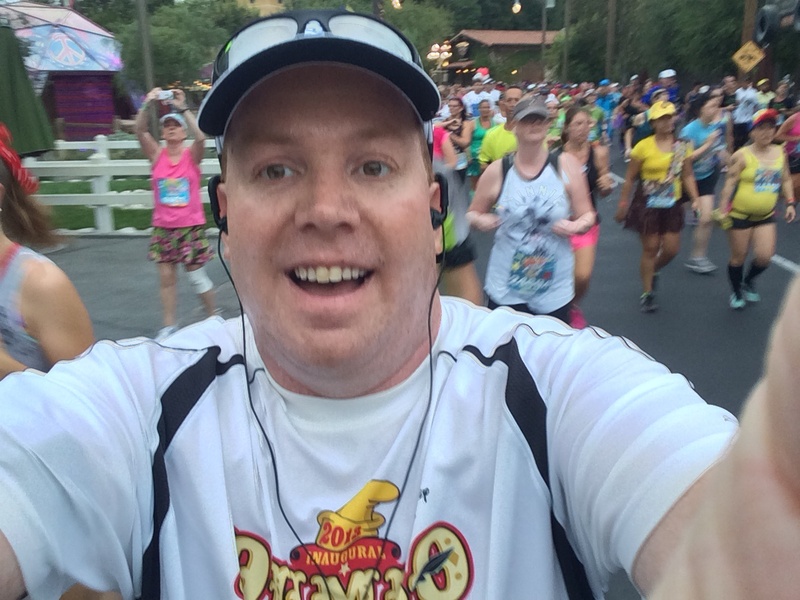 Last year, I would read some bloggers who got to meet him and/or Joey Fatone and wished I could have the experience of meeting a celebrity at a runDisney race. This was my year! 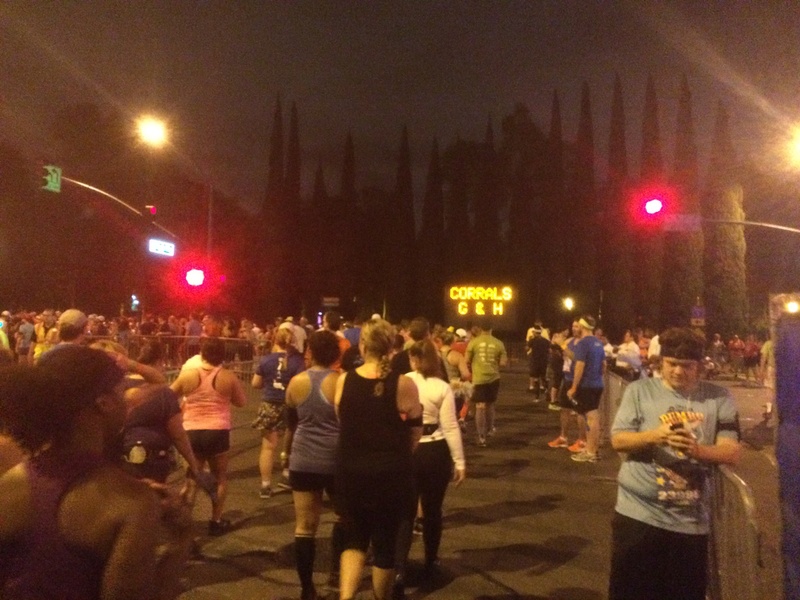 At Sean’s suggestion, I headed off to the starting corrals. On the way, I texted my former PR professor, Jessica, to see where she and her brother were at. The night before, I learned that they were both in my corral! So, after several texts, we finally found each other! 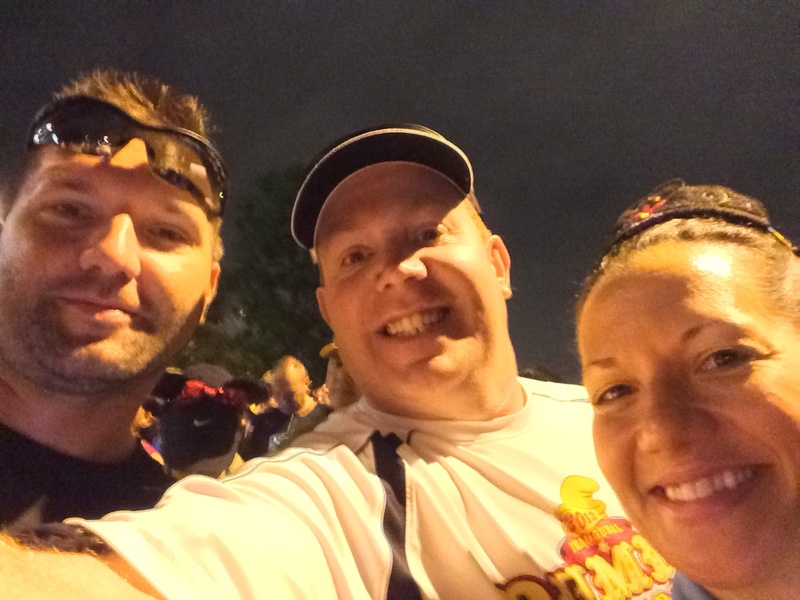 It was fun to chat with Jessica and her brother before the race! It really made the time were waiting to fly by. I should mention that we were in corral H. So, it was around a half hour of waiting from the time the first group left before we would start our magical journey. There were lots of people with us towards the back. Before we knew it, our corral was off. 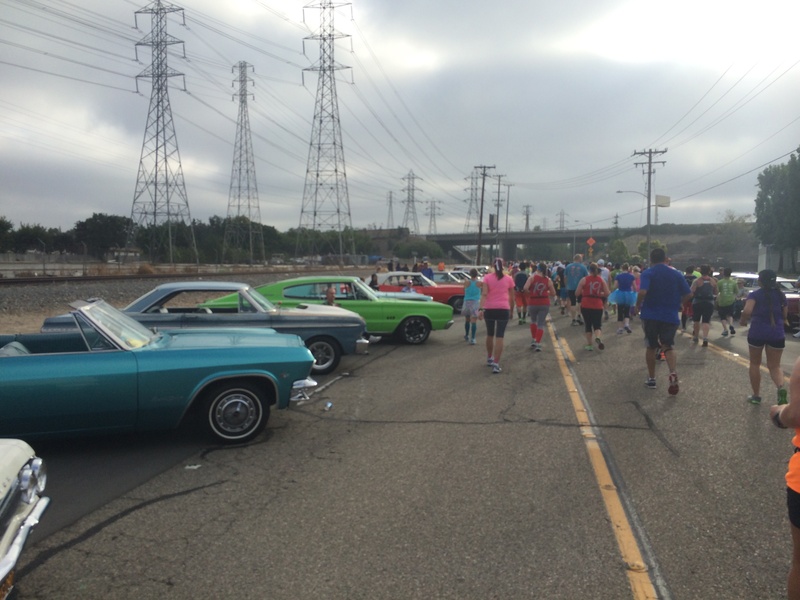 Of course, when you’re in the largest corral, it takes some time to get to the start line. Rudy was there again to send us off. I don’t think that Carissa was still there by the time corral H left. And, we’re off! I do like that the race course starts on a downhill. It’s a short downhill and a short uphill right after. But, it’s still nice. As you can see, it was very crowded. There was a little bit of wiggle room. So, in the beginning, I kept to my 30 second run/1 minute walk intervals. For most of the first mile this worked out well. I didn’t have to stop any of my run intervals during that mile. 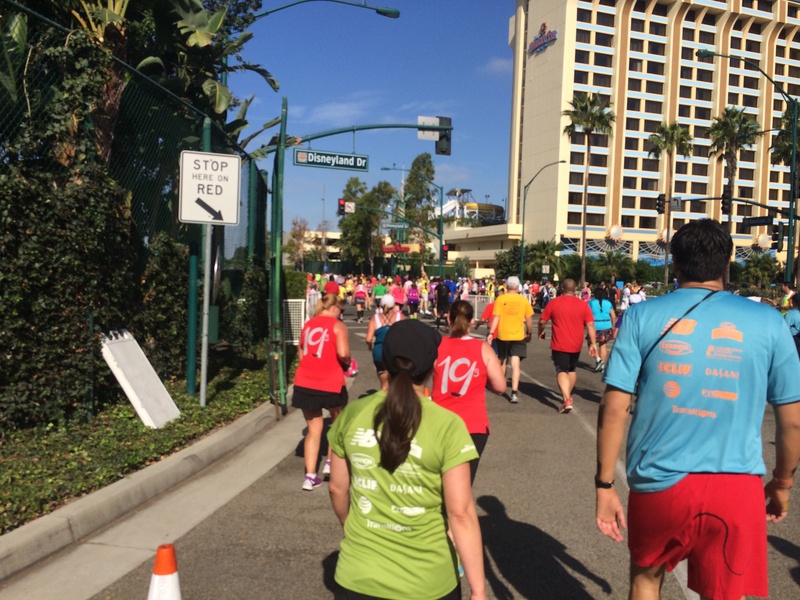 When we turned the corner onto Harbor Blvd., I thought that the course seemed more crowded this year vs. last year. My time was slower. That was fine. I was still a little quicker than my goal pace. To be honest, I was a little worried about how close I came to being over in the very first mile. After all, I had thought this mile would go much quicker. With the crowding on the course, some of my run intervals were finished a little slower than I’m capable of. Thus, the slower time. I tried not to freak out about this too much. Just make it to mile 4 was my mantra. Before we knew it, we were entering the back stage part of Disney California Adventure (DCA). It was exciting to be so close to getting on stage! Here is the flag people from the first marching band back stage. Boy was it crowded in this backstage part of the course! 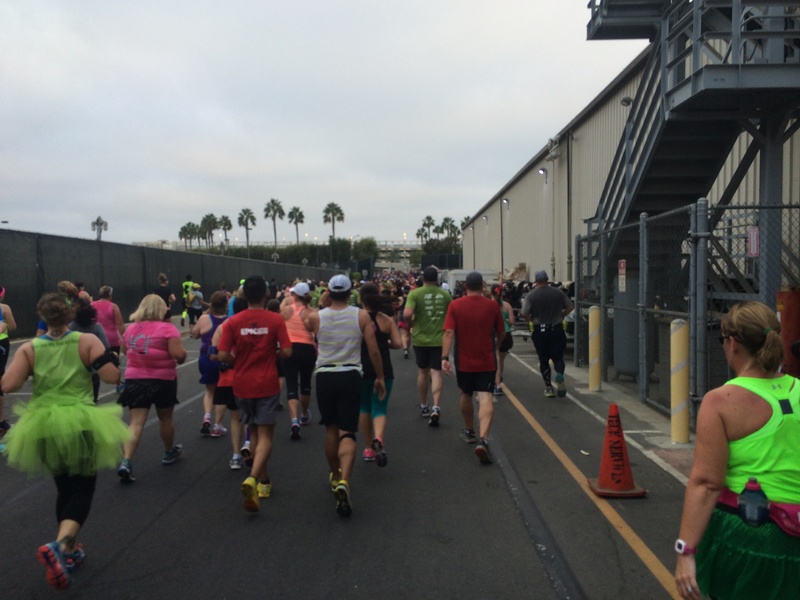 The crowding lead to missed run intervals because I couldn’t get around anyone. They did have this float from the Pixar Play Parade. It’s the float for the Incredibles. I didn’t stop because I was falling behind in my goal pace already. Things didn’t get much better after this. 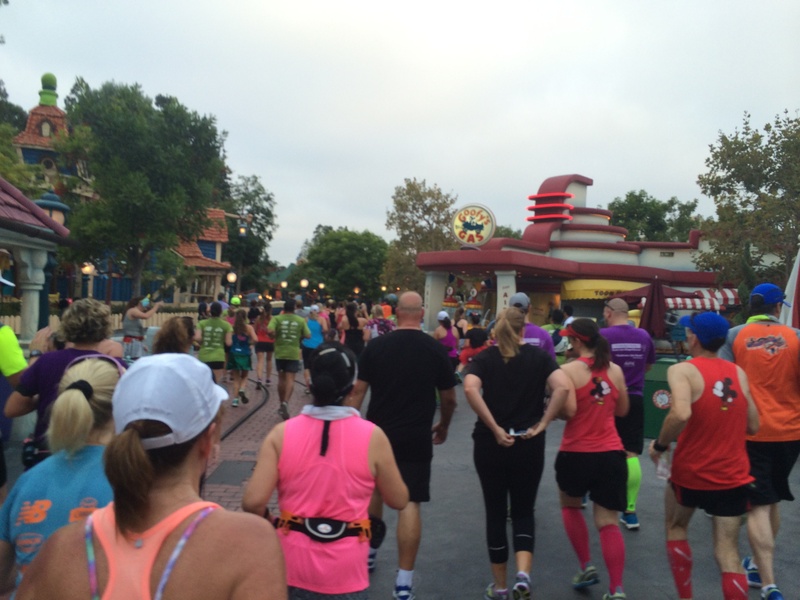 As we approached the entrance to the onstage part of DCA, the folks at runDisney chose to place the first water stop. This was NOT a good idea. 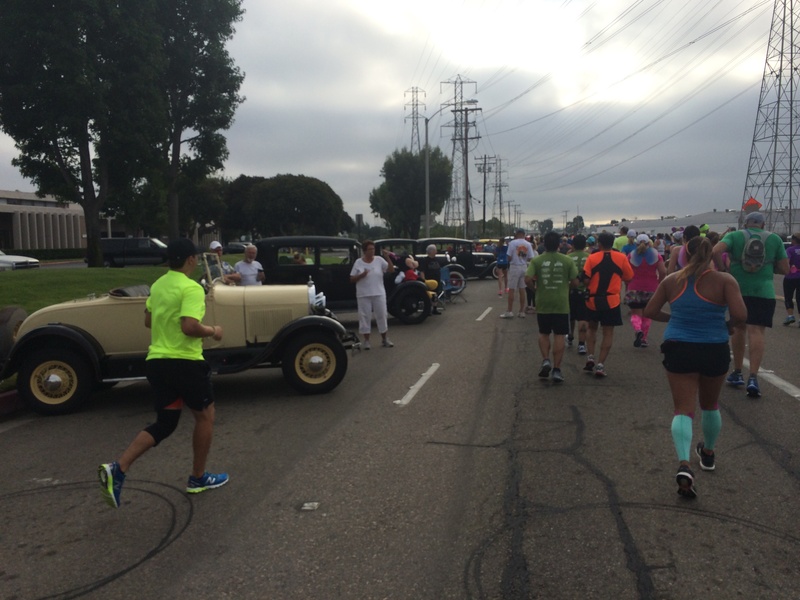 The race came to a literal stop as the runners stopped to grab water. I wish more people understood that you can get water a little further back as well. I’m not being sarcastic here. I literally had to stop for at least 20 seconds at the first water stop. Urgh! 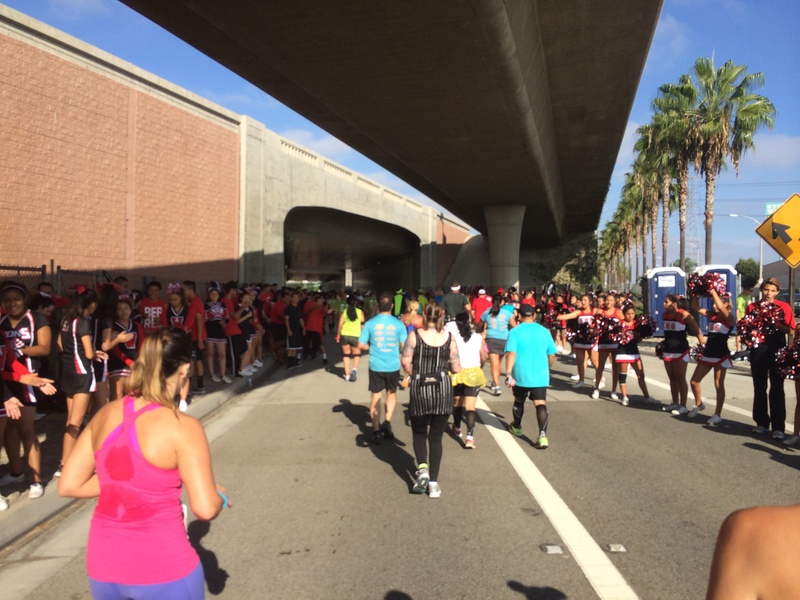 Once we passed the water stop, I sprinted around the large pack of runners in the middle to try to gain some of that time back. 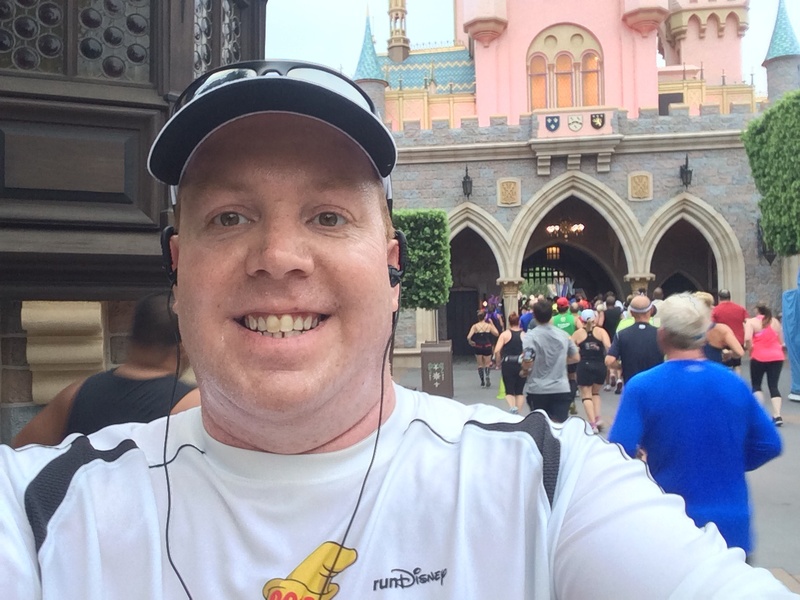 For the Disneyland 10K, I stopped around here for a picture. 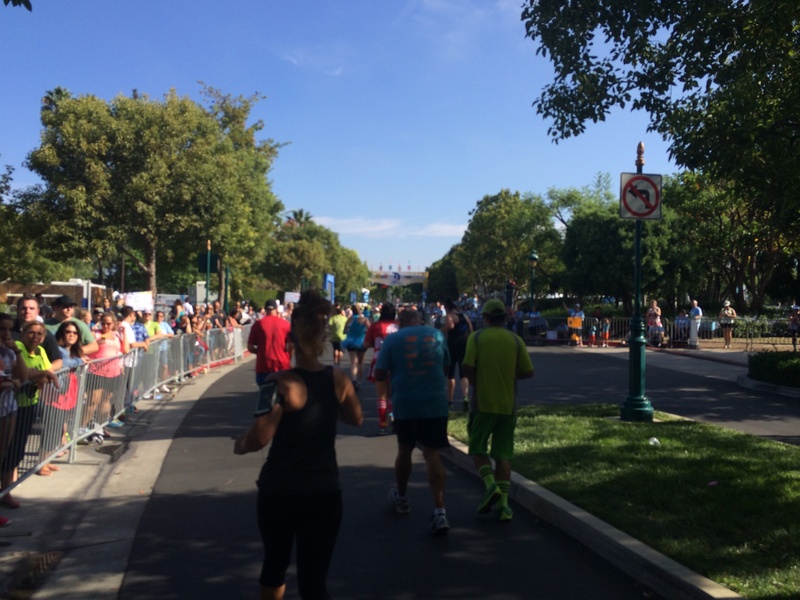 During the Disneyland Half Marathon, I didn’t have that time. By the mile 2 marker, I was already 30 seconds behind. 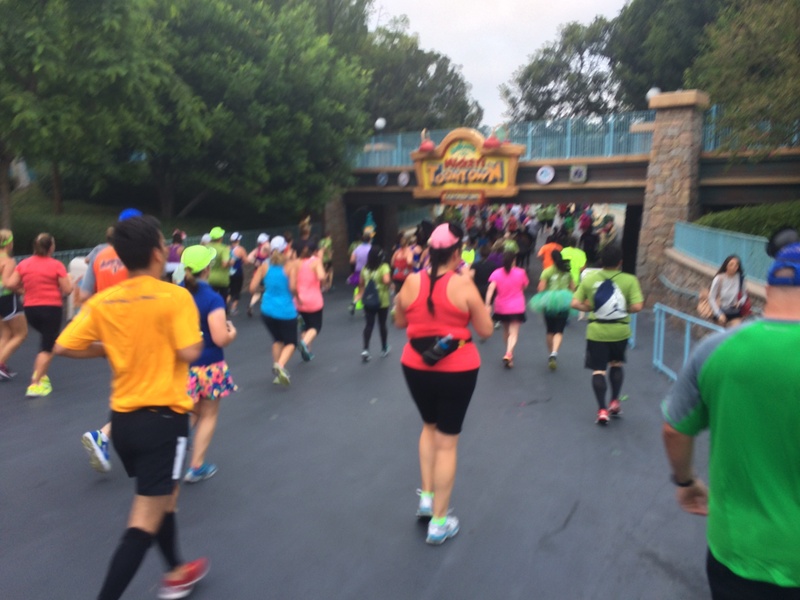 FYI, my running playlist was working perfectly as I listened to Under the Sea while passing by the Little Mermaid: Ariel’s Undersea Adventure! It did start a little before I got there (thanks to being behind my planned time). However, it carried me half way down Cars Land. 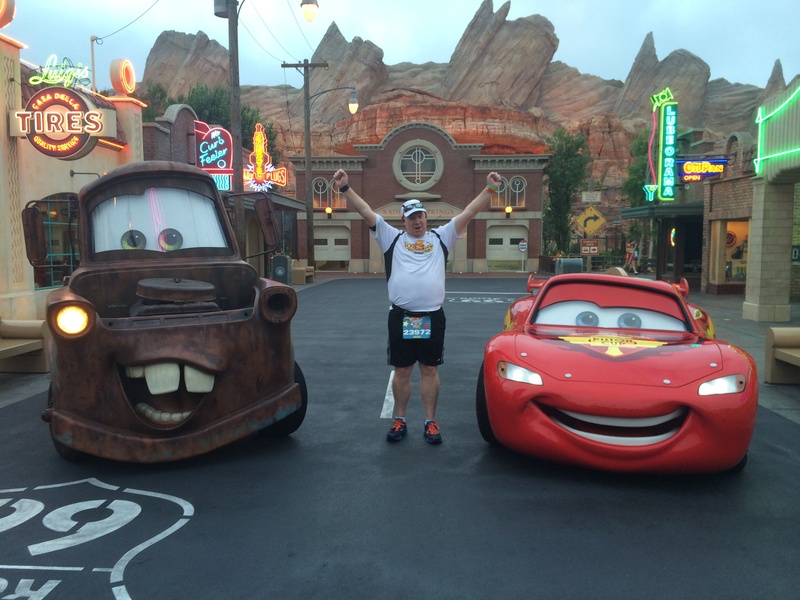 Then, Mater’s Welcome to Radiator Springs kicked in. Yep. Welcome to Radiator Springs! 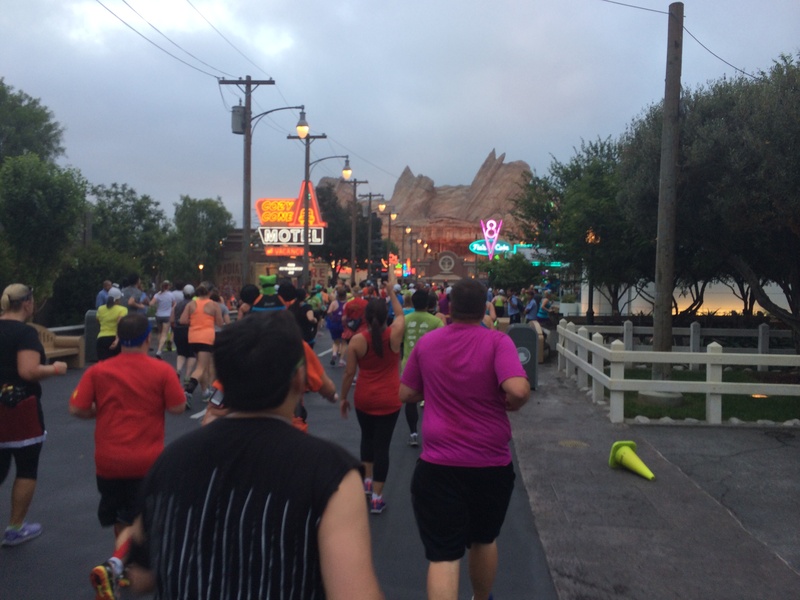 Heading down Route 66 (aka Radiator Springs…aka Cars Land) was so much fun! I ran a little more here to try to make up some time. 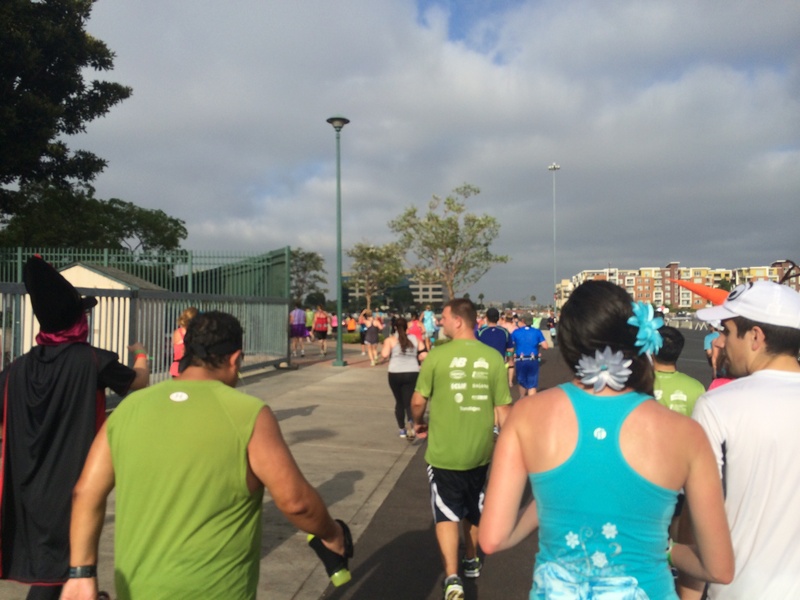 Ok…when you’re behind your pace, it’s not the best idea to get in a line to wait for a picture. However, it was Mater and Lighting McQueen. I just couldn’t resist. In line is where I decided that I’d wait until after leaving Disneyland to decide whether or not to run this race completely for fun or to chase down that time goal. Also, while in line, I paused the music for a bit. By the time we got here, I was hearing Life is a Highway. It actually began as we were on the path to the backstage area by the Twilight Zone Tower of Terror and continued through the rest of our time at DCA. It was working perfect! (well, with the help of a stop). At this point in the race, I was behind my goal but still having fun! As we ran up Hollywood Land, I was deciding whether or not to stop for another picture with the Storytellers Statue. By the time I decided to do so, we had passed it. I did this last year as well. Oh well. 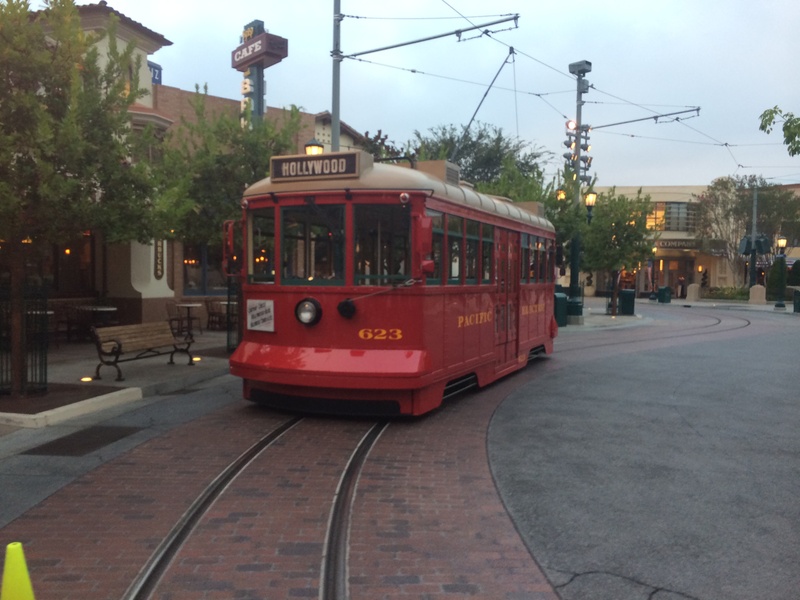 So, I got this picture of the Red Car Trolley instead. After passing the Carthay Circle Restaurant, we made our way towards Condor Flats. 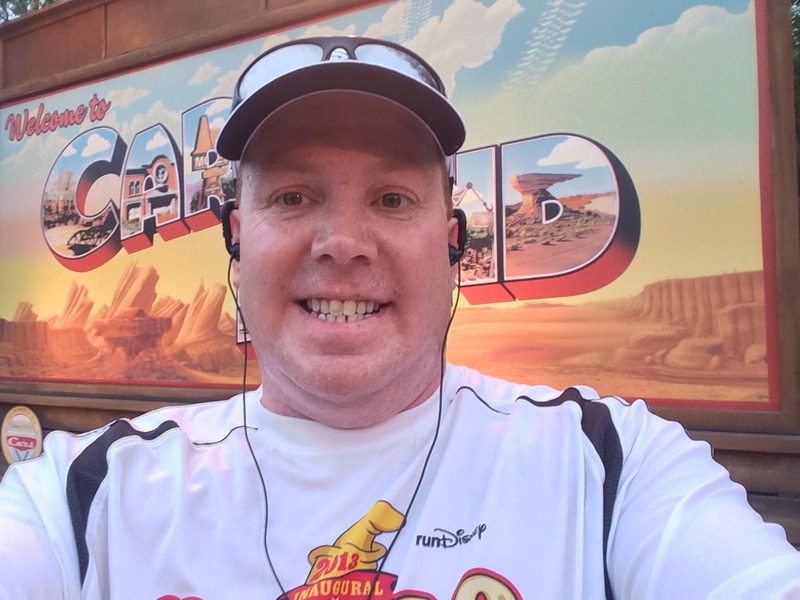 I had altered my run/walk intervals from the start of Hollywood Land through the end of DCA to a 35 second run/55 second walk. There was some more room to run in this part and I was hopeful that i could start to make up some time. 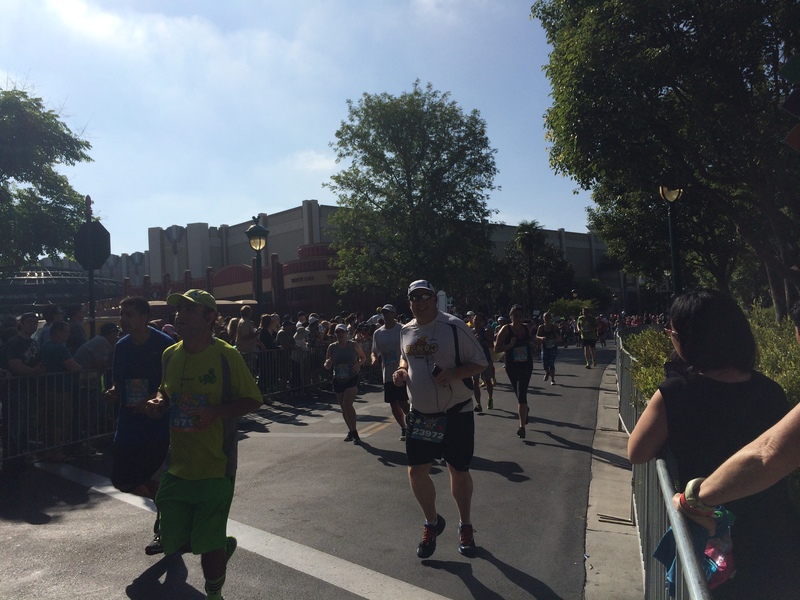 I felt great running through this part of the course. I might have even thrown in a 1 minute run interval in this part somewhere. We passed by Soarin’ Over California and made our way out of DCA into Downtown Disney. Of course, we were really close to the Esplanade at this point. 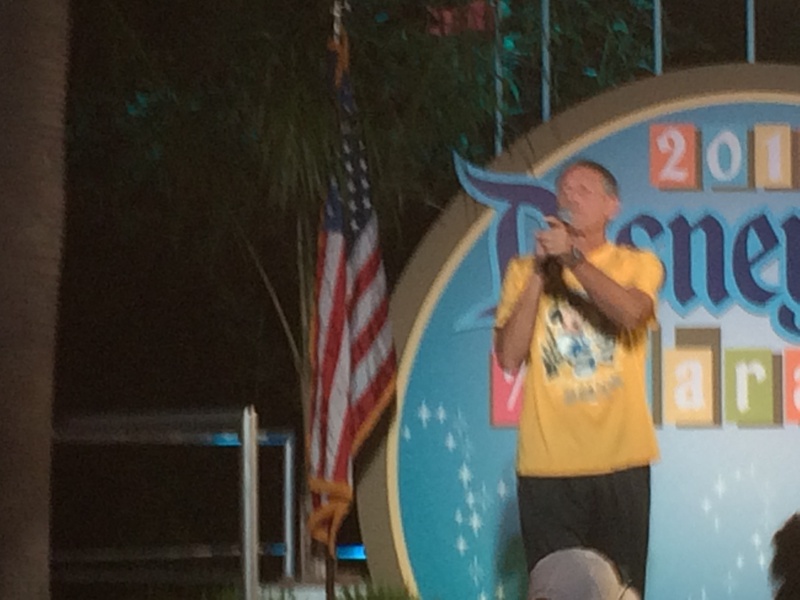 So, we didn’t see much of Downtown Disney. 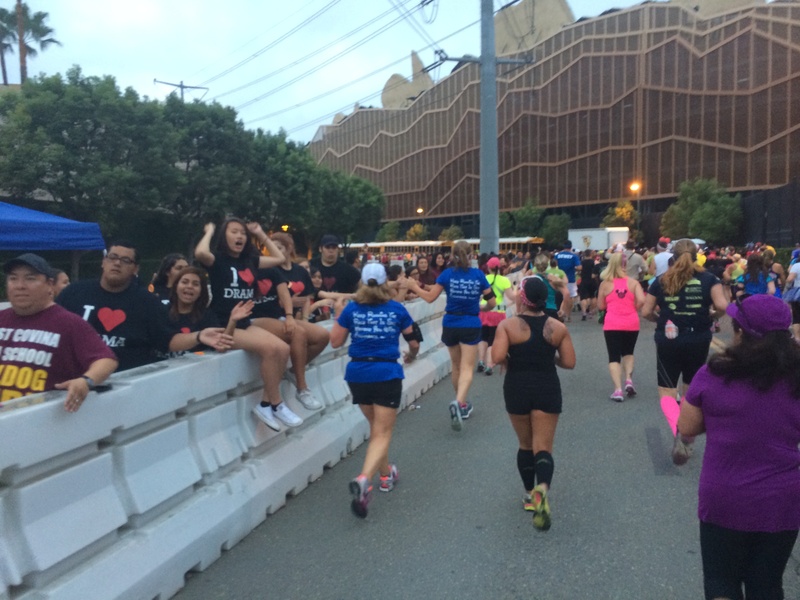 I love the crowd support in this part of the course! Almost into Disneyland. Somewhere in the Esplanade, the Mickey Mouse March started to play in my playlist! I was pretty happy with how the playlist worked while in the theme parks! I wish I had taken a better picture of the crowds during this part because they were amazing! 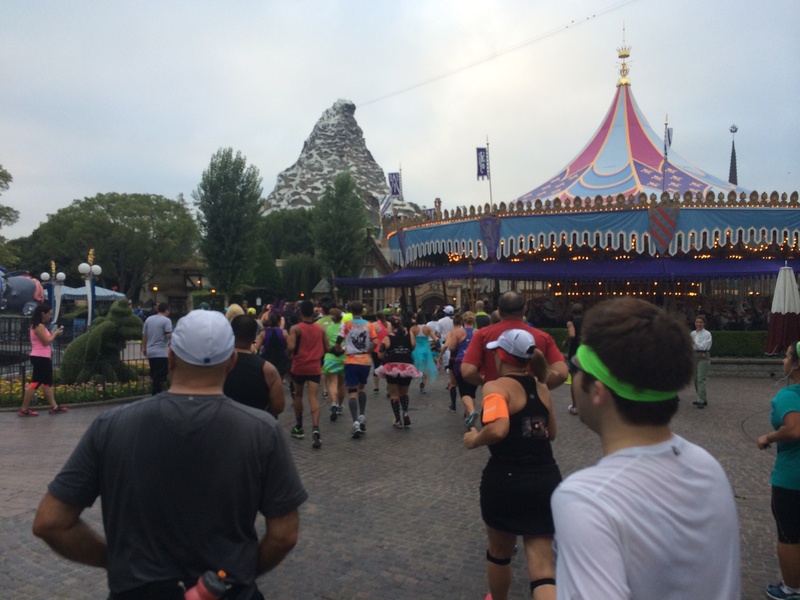 Since you can’t be on Main Street U.S.A. without paying money at the Disneyland races, this is as close to the experience of running down Main Street U.S.A. at the Magic Kingdom as we will get (inside a Disney theme park. 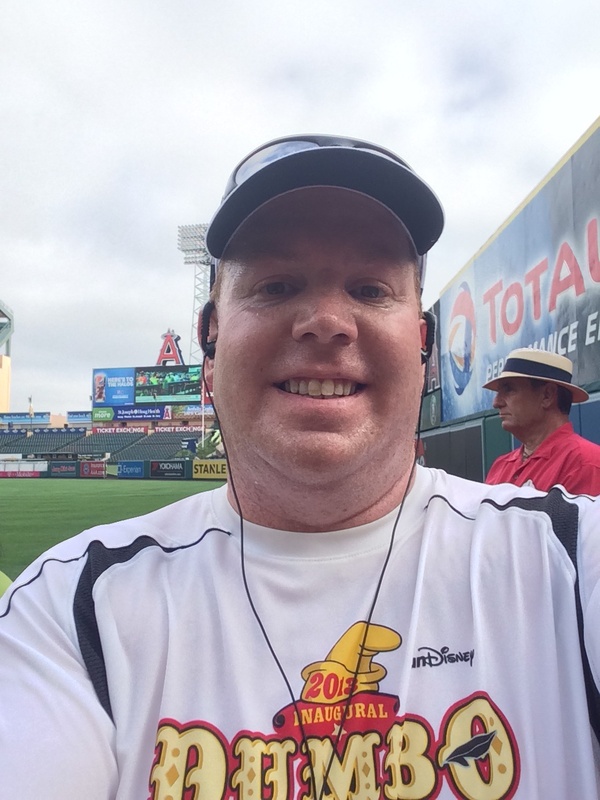 running through Angel Stadium is an amazing experience!). 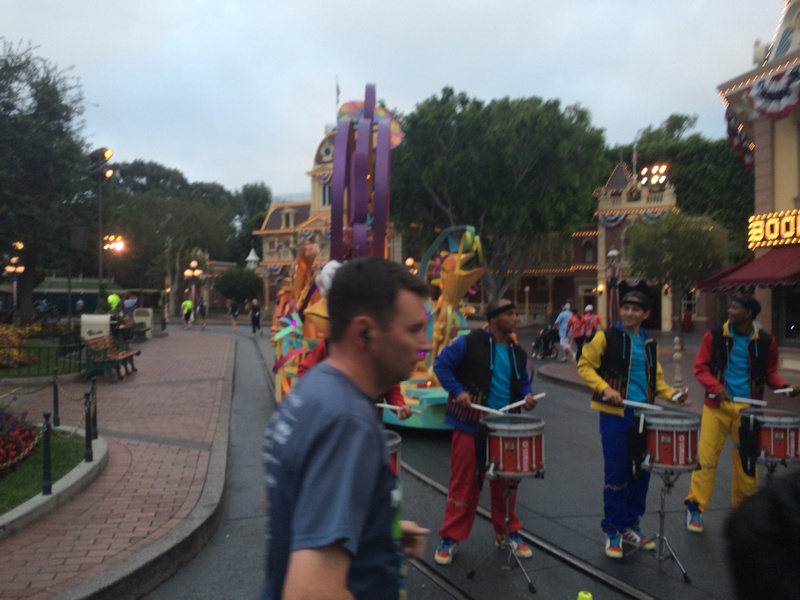 They had the drummers out from Mickey’s Soundsational Parade to help keep the energy going up Main Street U.S.A.! 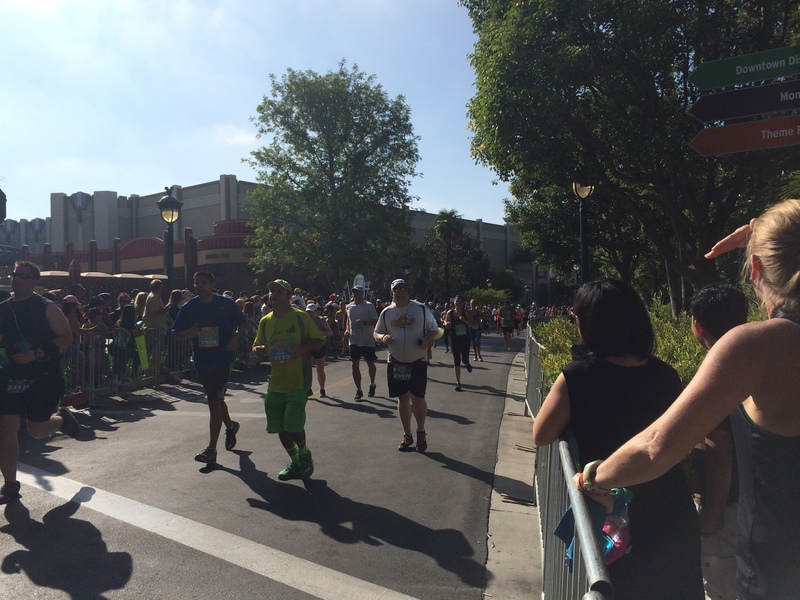 Gotta love running up Main Street U.S.A. 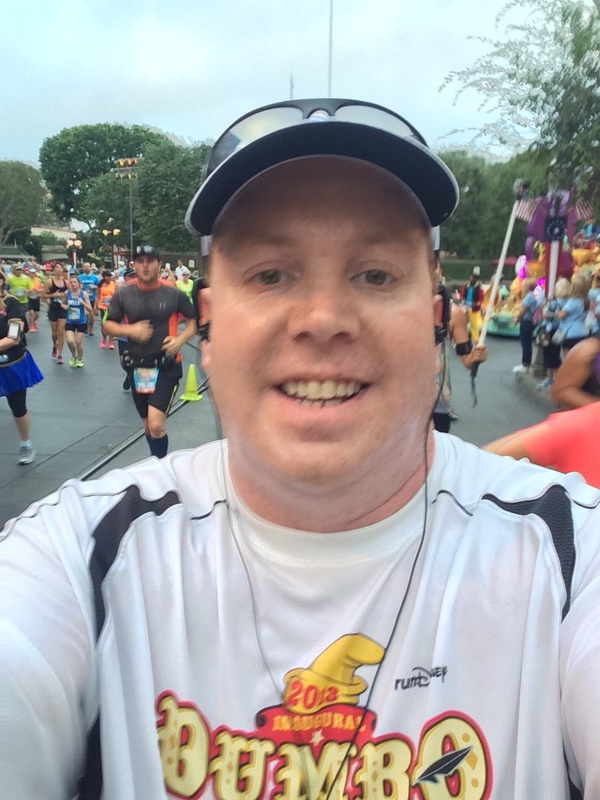 I took this selfie because you never know what the Marathonfoto guys are going to do. 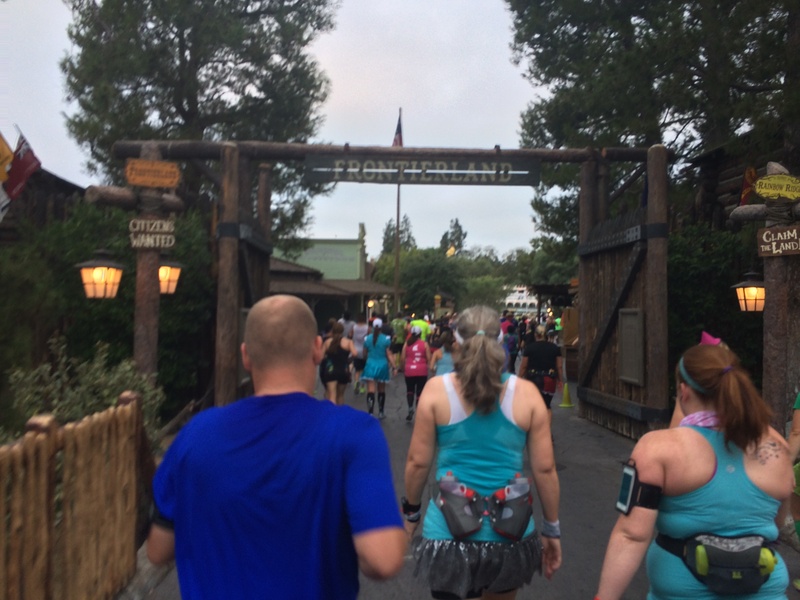 From the hub on Main Street U.S.A., the course turned to the left and we made our way through Frontierland. Right about this time, When We’re Human (from Princess and the Frog) kicked in. Of course, it was cooler to hear that song when we got close to the Mark Twain than at the start of Frontierland. 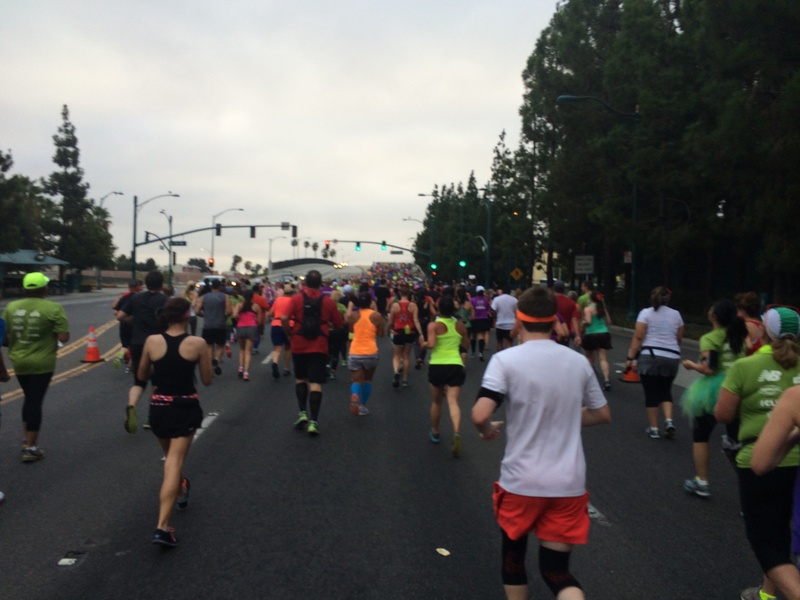 At this point, I was still holding on to my pace and was only a little behind. We crossed the 3 mile marker on the path to Big Thunder Ranch. At that point I was around a minute behind. It wasn’t looking good. I still kept the mantra of not freaking out until after we leave Disneyland. Enjoy the race! Love is an Open Door was playing while I took this picture. However, the track ended way too short for my liking. 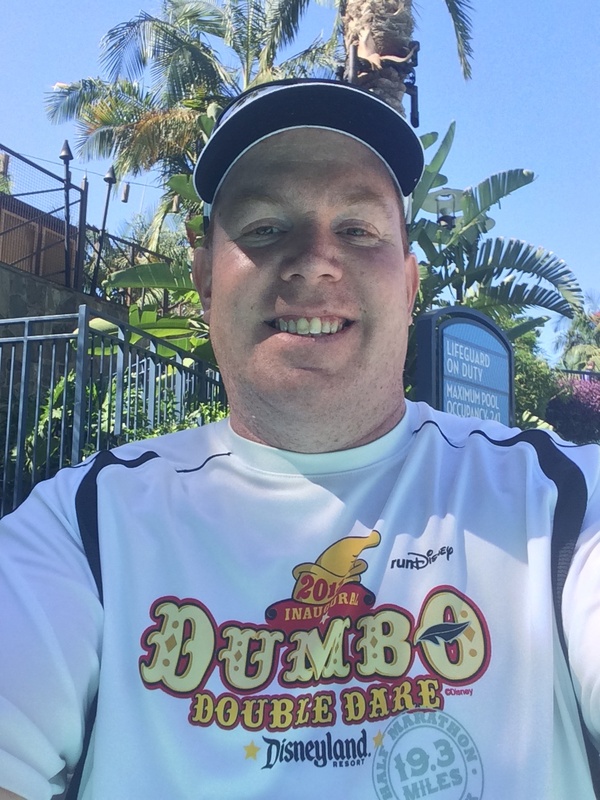 I did think about ditching the race course to get a picture with Dumbo. 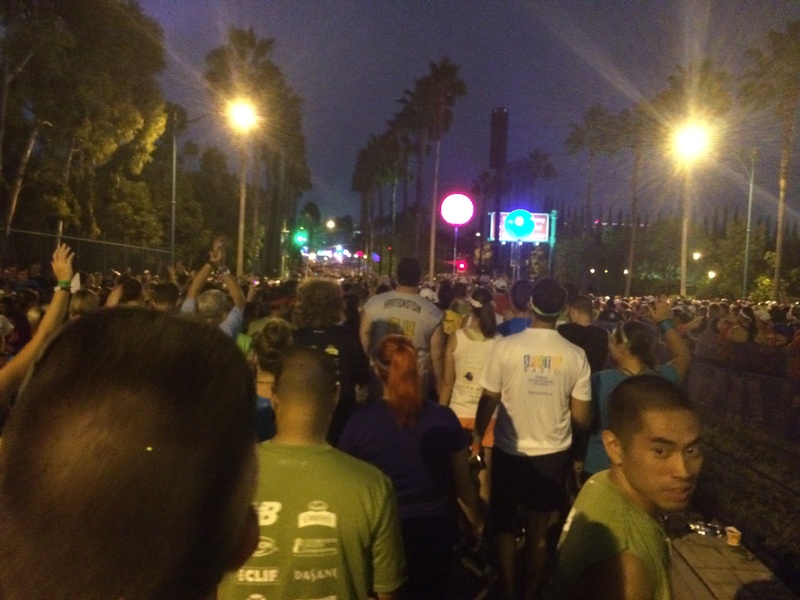 However, the line of runners with a similar thought was way too long and I still had hope of running for time. So, I continued on. 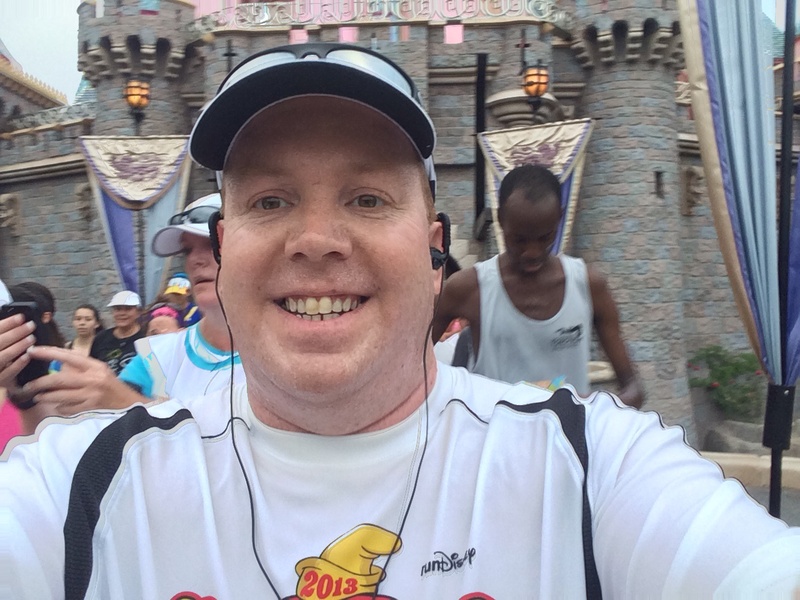 I took a picture in a similar location at the Walt Disney World Marathon. So, I had to do the same here. After all, I was still unsure about the time thing and wanted to keep the fun levels high. With so many people running around me, it was hard to find a spot where I felt alright stopping. It should be noted, that the Star Wars Theme/Imperial March track was already playing here. Darn! 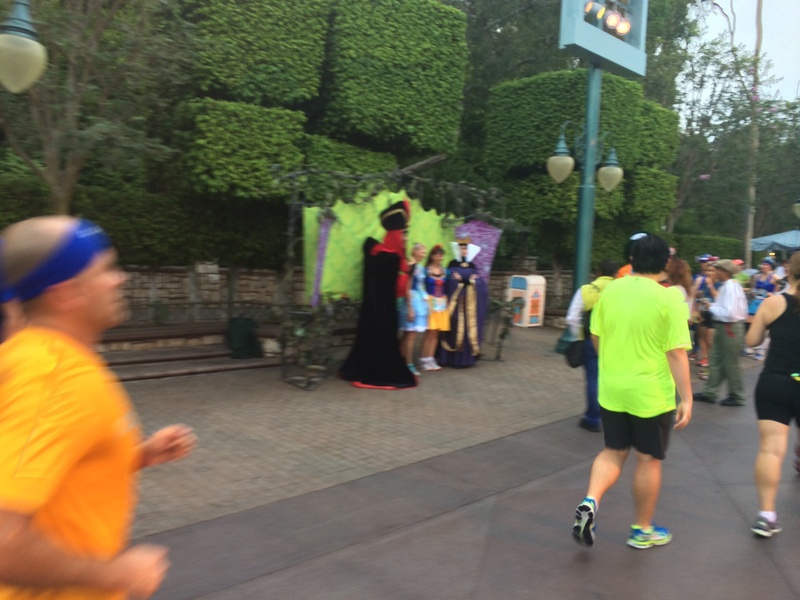 I really wanted that to begin AFTER I ran through Sleeping Beauty’s Castle. Oh well. 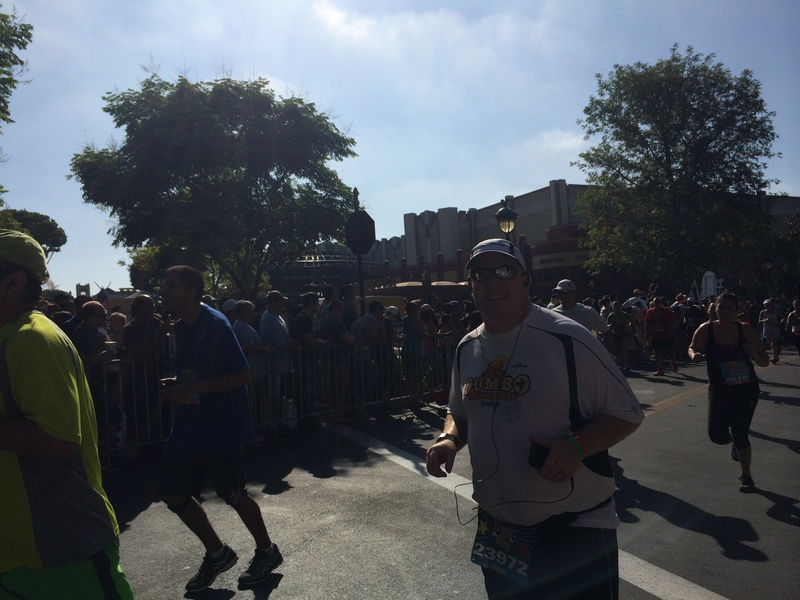 I took this photo right after passing a Marathonfoto guy who seemed uninterested in getting a picture of me. So, I got my own instead. It appears that someone in an Alice costume had the same idea. Great minds think alike! 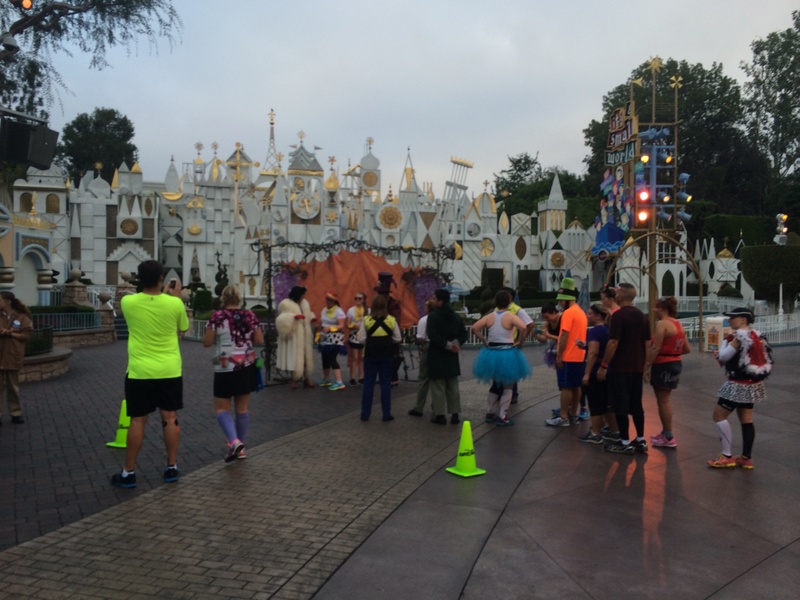 And one more with Sleeping Beauty’s Castle…take THAT Marathonfoto! I don’t need your picture when I can get my own! Ha! The Imperial March part of the track was still playing as I made my way through Tomorrowland! You know what? That’s an awesome track to run with! 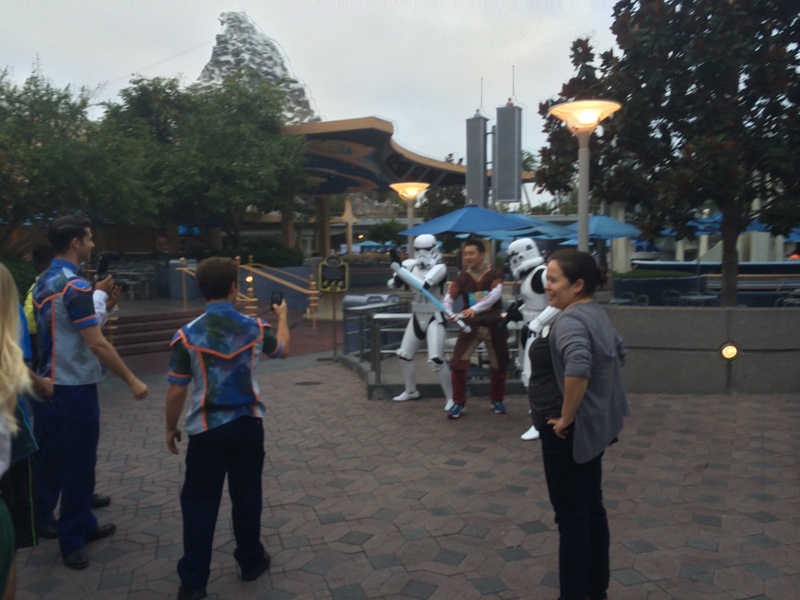 No Darth Vader and a really long line means I’ll just take a photo as I passed by. 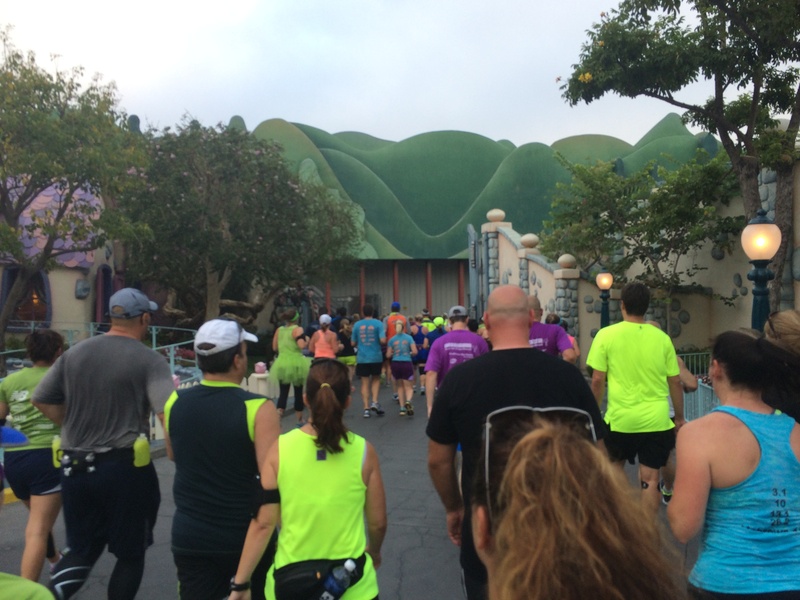 Much like with the Disneyland 10K, we wrapped around Tomorrowland, up towards the Matterhorn and eventually on the path to It’s A Small World. My run intervals were going really well for part of this. They had several of the Disney Villans out for pictures along the path to It’s A Small World. I did have It’s A Small World playing in my ears while I approached the attraction, though! Again, the line looked too long to wait in. So, I snapped a picture and continued on. By this point, Ever Ever After had just started. Off to Mickey’s Toon Town! This year, I did not stop to use the last real restroom on the course. Although, I wish I had. Porta potties aren’t very much fun. As I went through Mickey’s Toon Town, I was taking it all in. After all, the end of our time in the theme parks was approaching and I was more than a minute and a half behind my goal. 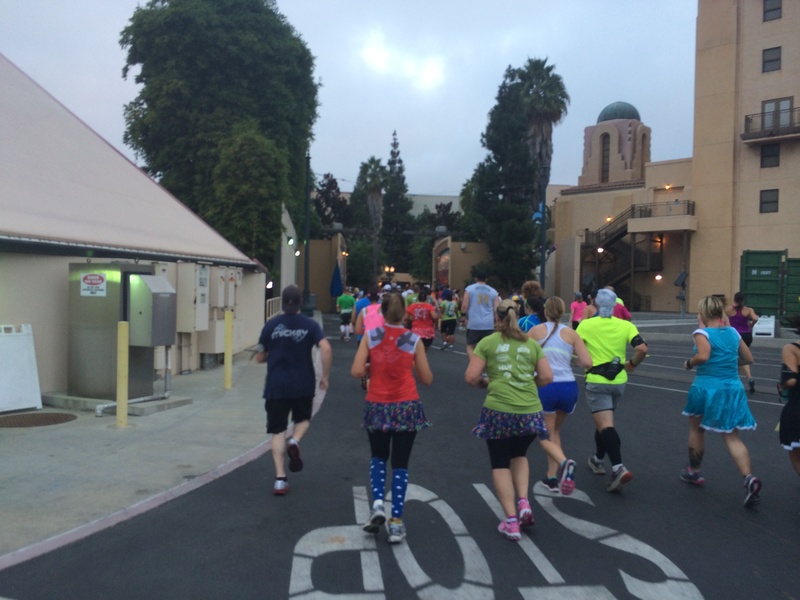 The last glimpse of being in a theme park on the Disneyland Half Marathon…sad times! Then, we were backstage at Disneyland on our way to the streets of Anaheim. By the mile 4 marker, I was nearly 2 minutes behind my goal for the race. It didn’t look good. I did think to myself that if I kept that up, I’d still beat my time from last year. 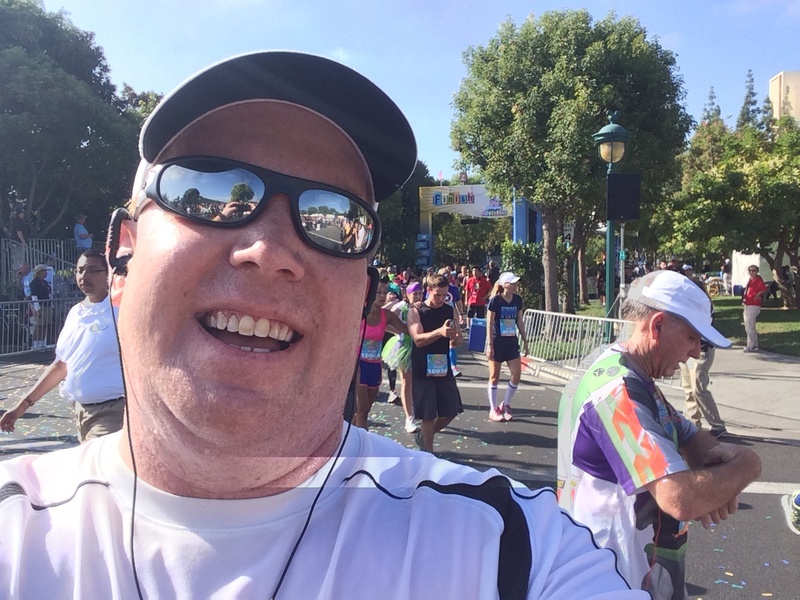 So, that was my task…to see how close I could come to my goal and still beat the my time from last year. As we headed up Ball Road, the cloud cover was heavenly! There would be no running directly into the sun this year! Hooray! Without the crazy sun, I could actually get pictures of some of the groups along the road. There were no hula dancers this year. So, when the Hawaiian Rollercoaster Ride came on, it was only a fun song to run with. 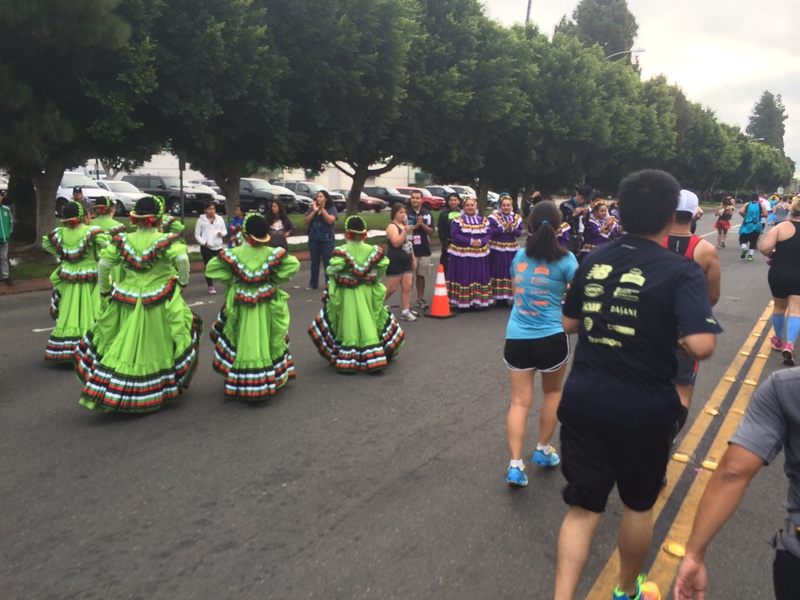 Instead of the hula dancers, we got some Mexican dancers instead. If only I’d known ahead of time, I could have found a different track. After Hawaiian Rollercoaster Ride finished, my race officially tanked. 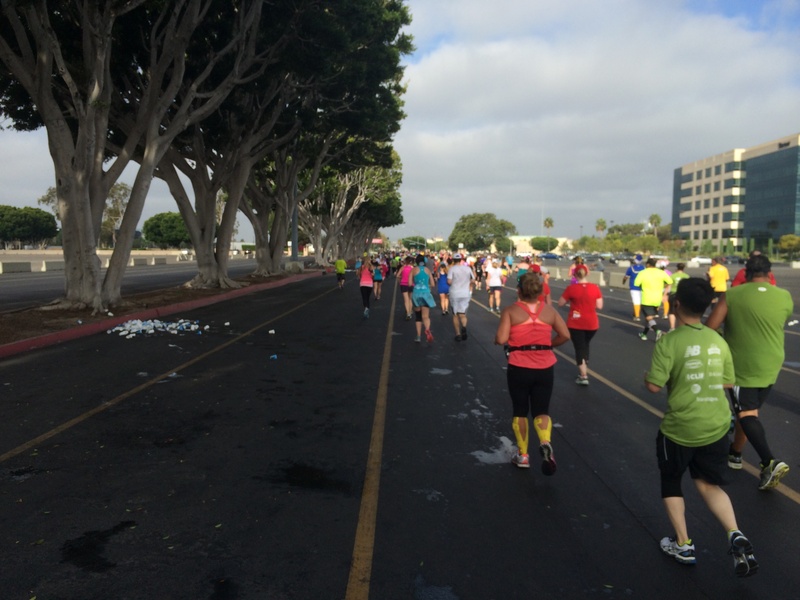 I was falling farther and farther behind my goal pace. 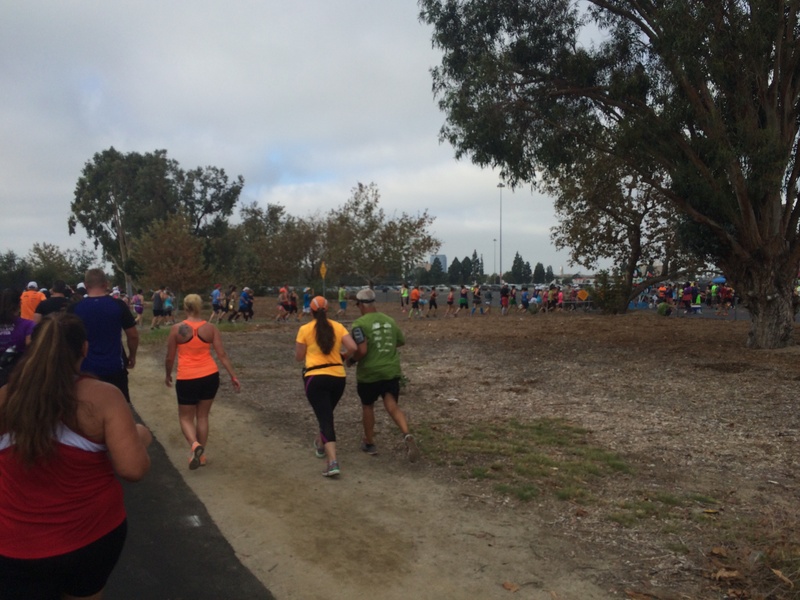 Then, close to the mile 5 marker, I needed to use the porta potties and could not wait. The 5 minute plus wait time officially killed my hopes of running faster than the previous year. 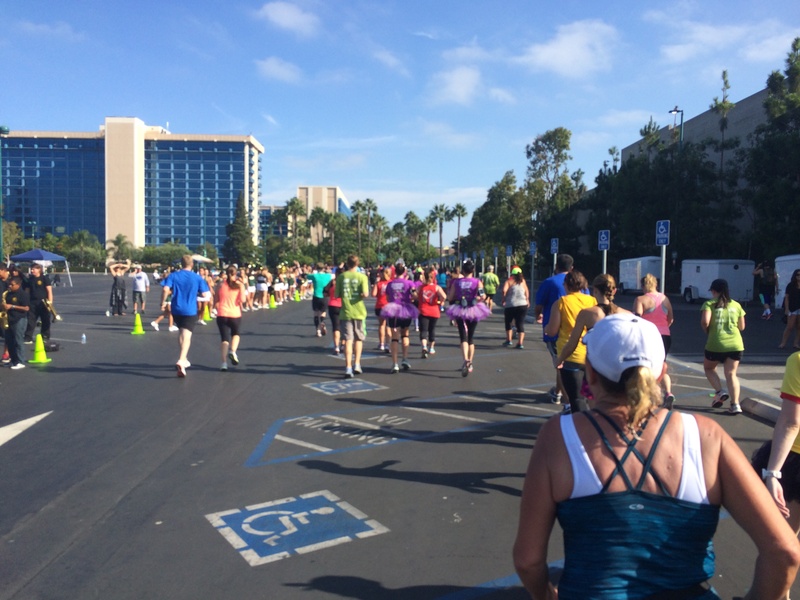 As I watched the clock continue while I was standing still, I dealt with the disappointment about my time and changed the focus to making this the funnest half marathon ever! As I thought of how to make this race super fun, this part of the course dominated my thoughts. Since it was cloudy and I knew the sun would not ruin any pictures, I couldn’t wait to get here and take pictures of as many of the cars as I could. 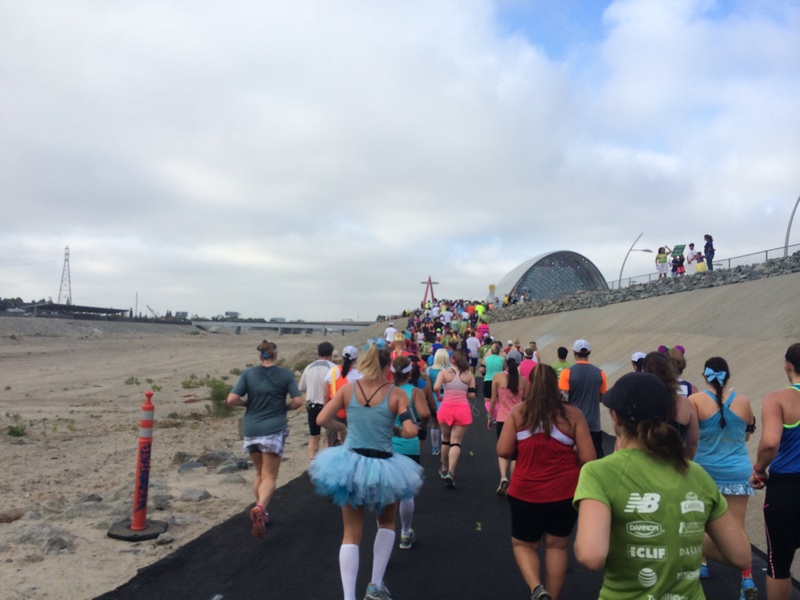 By the time I crossed the 6 mile mark, I decided not to think about my finish time until mile 10. I ran as much as I could. 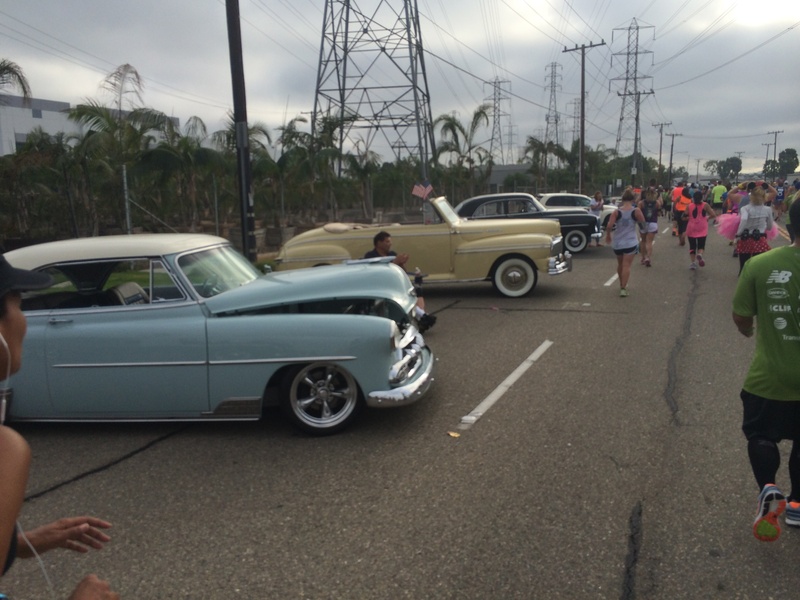 However, once I got to the cars, I walked almost the entire way. Cars from this era are so cool! Don’t you think? I had my two Brian Setzer Orchestra tracks playing the entire way to the Honda Center. It fit really well! I was lovin’ every minute of it! The owners of the cars are so amazingly supportive! I did run a little over this stretch because of their encouragement to do so. I was really happy to get to the Honda Center. 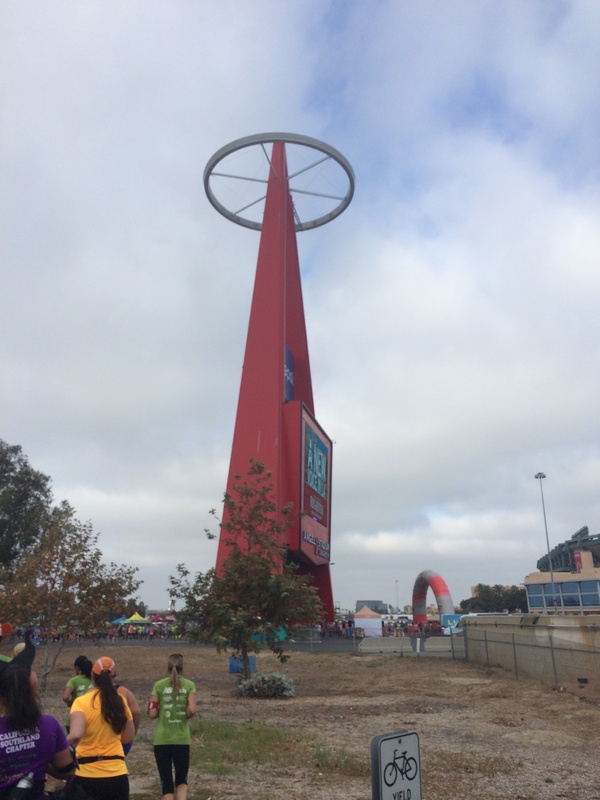 After all, Angel Stadium was about a mile away! Funny story about this picture. When I took it, a guy who was walking near me thought I was taking a picture of the grey, brick wall in front of me. 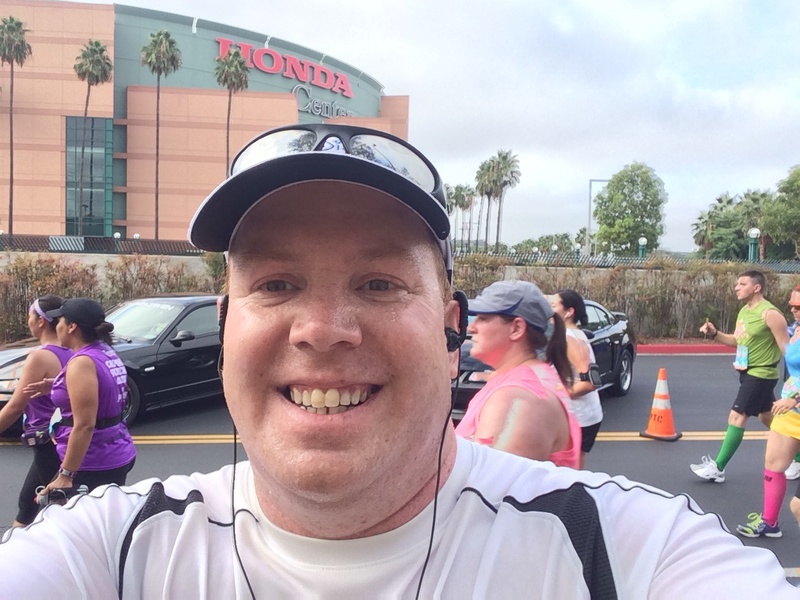 He didn’t realize I was taking a selfie with the Honda Center in the back. In the Honda Center, the car show went from classic to modern. 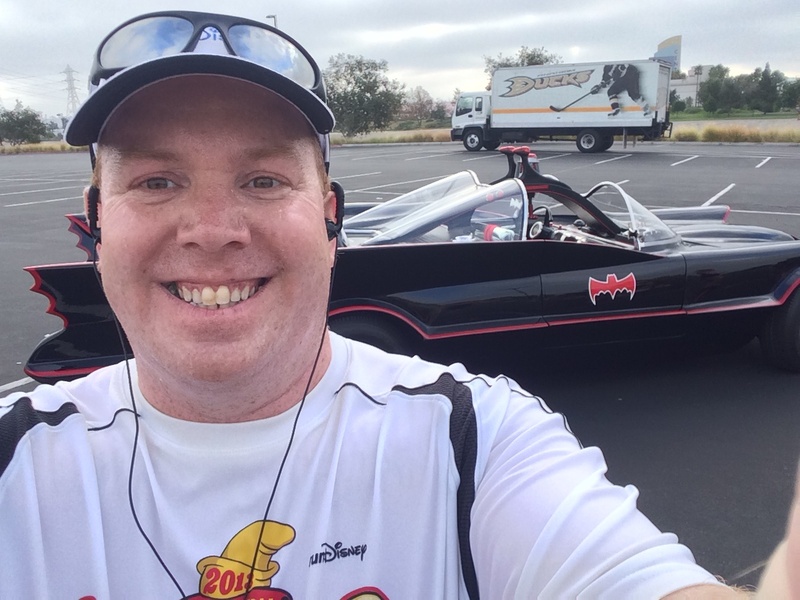 At the end of the cars was the Batmobile! The 1970’s era Batmobile! I was pretty stoked! Last year, I just got a picture of this car. This year, I had to be in the picture. 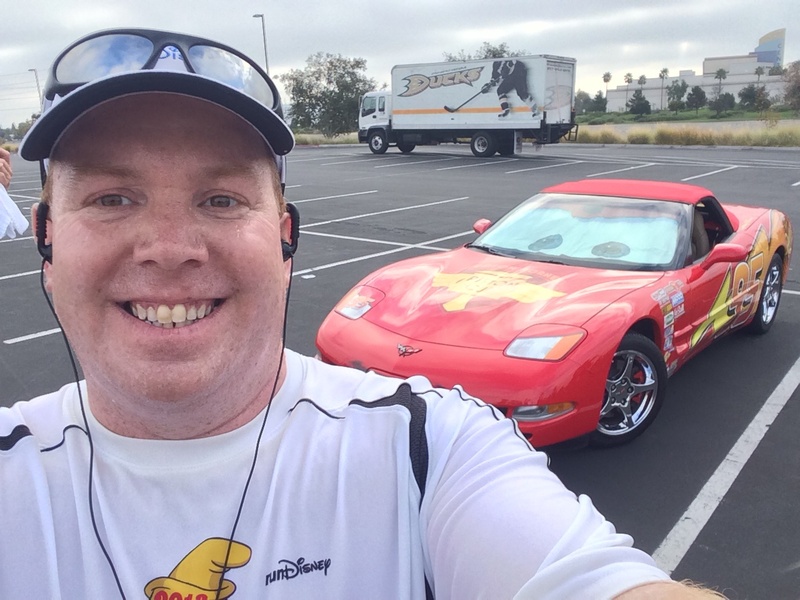 After all, I was already in a picture with ONE Lightning McQueen. This race was all about having as much fun as possible now. Time was out the window. So, snap, snap, snap the pictures I did! After the Honda Center, it was time to hit the dirt…literally. 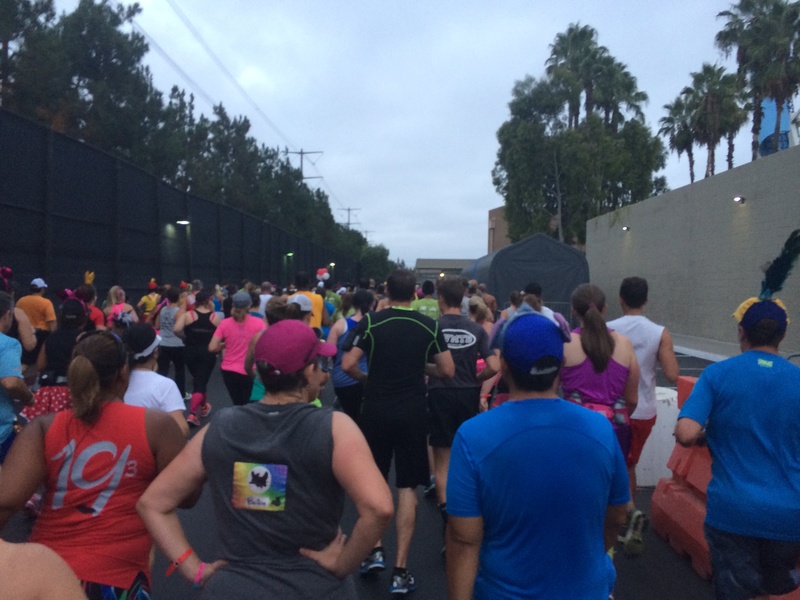 We ran up the Santa Ana River Trail. The dirt does eventually give way to asphalt. 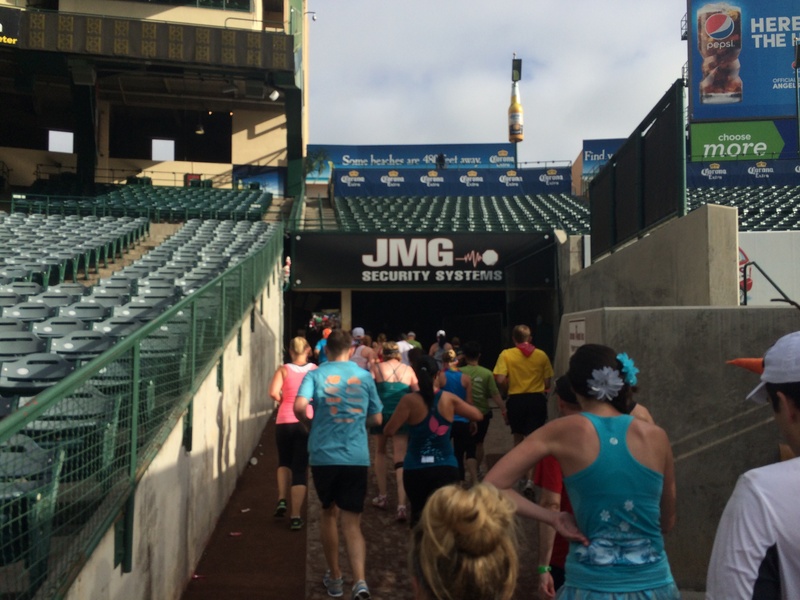 Surprisingly, I was able to run in this part of the course. I went back to my intervals of 30/1. 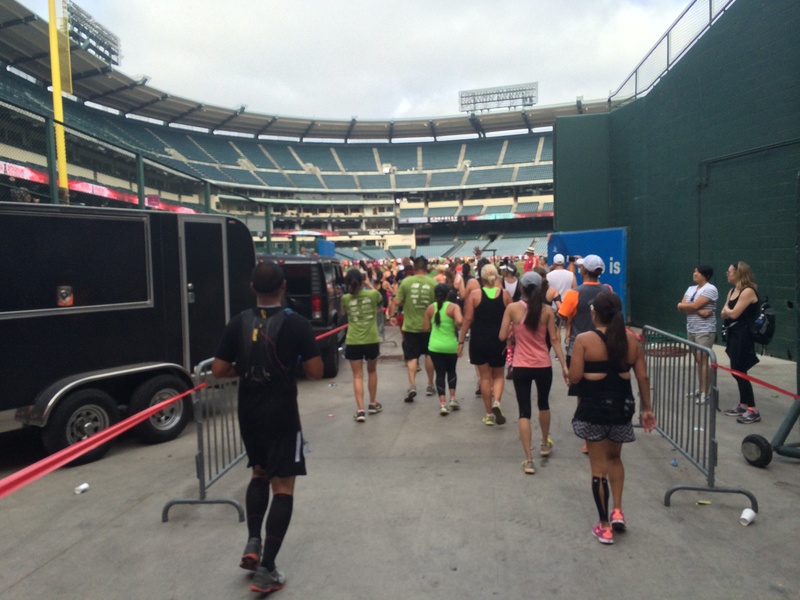 Angel Stadium was calling. I couldn’t wait! 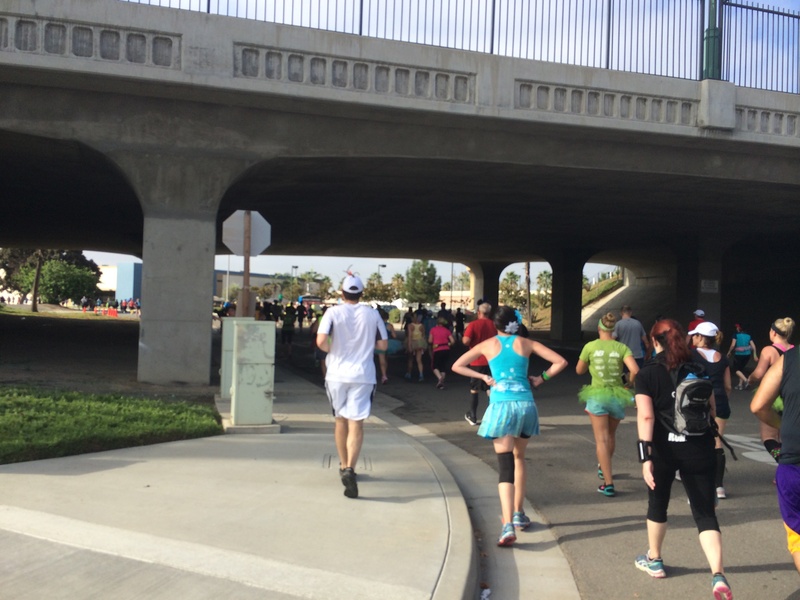 The Santa Ana River Trail came to an end at the end of mile 9. No one was sad about that. This was a pretty good one. I was actually taking the pictures and hoped for the best. I skipped the Cliff Shots gels because the stadium beckoned. At this point, I also turned off the music on my playlist. It was totally a spur of the moment kind of thing. But, I wanted to run through the stadium without music. To get in, you head down a pretty steep ramp. I had forgotten how steep it was. 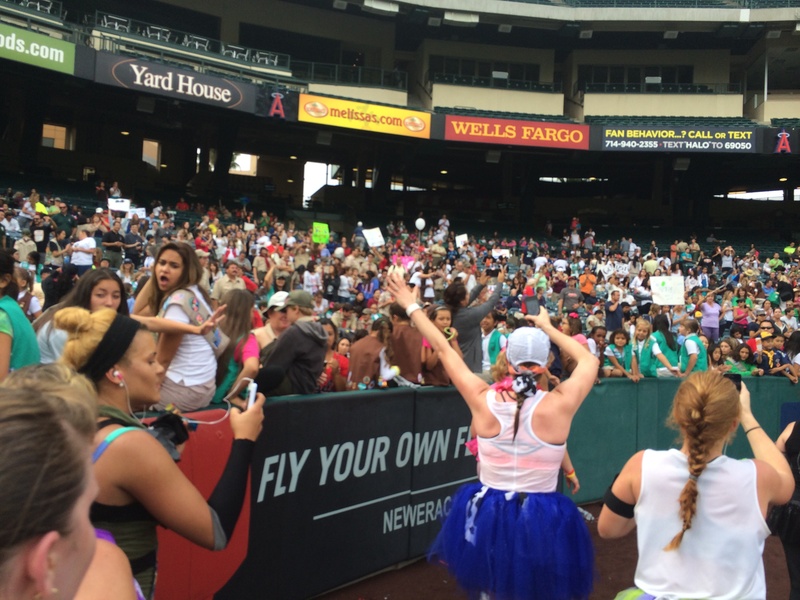 you’re on the warning track of Angel Stadium! Check out the crowd support! 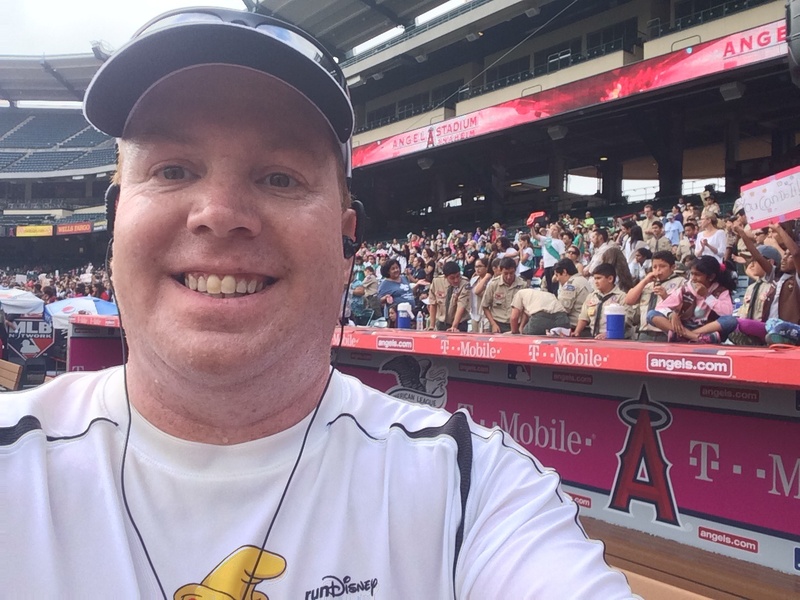 I got a picture with the visitors dugout at the Angels Baseball Foundation 5K earlier this year. So, I repeated it here. Fun times! 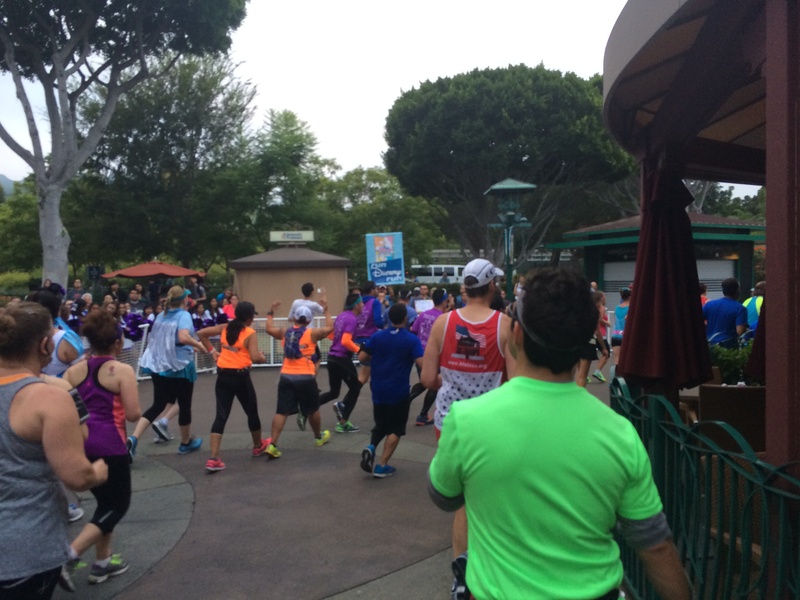 Shortly before passing this part, there is an announcer who announces everyone’s names as you pass by. 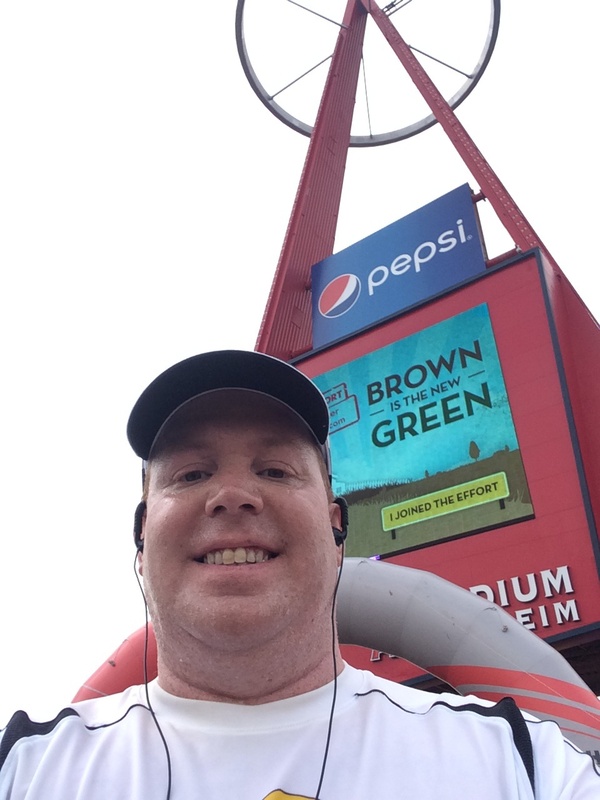 Since I didn’t have my music going, I heard my name over the speakers at Angel Stadium! Happiness! Since I saw others posing for pictures close to home plate, I did the same! 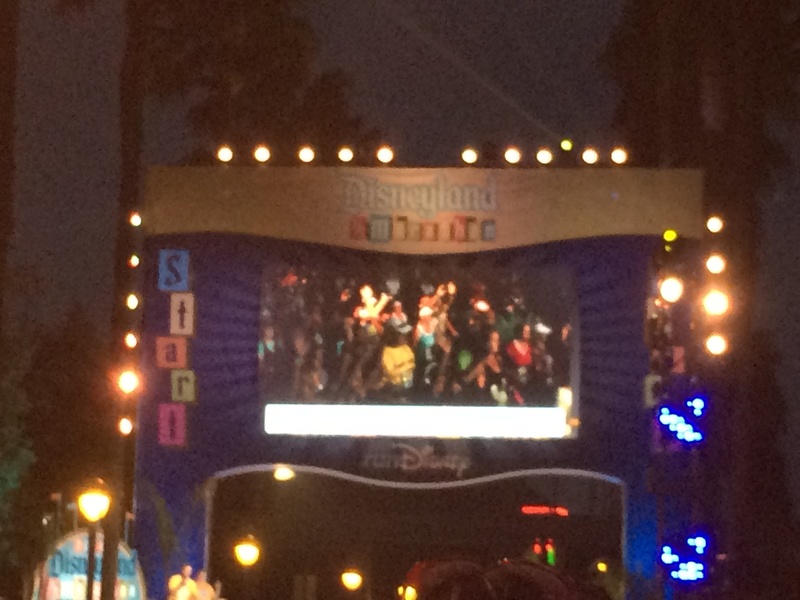 See the Disneyland Half Marathon logo on the score board? Now, it’s on the other side. Yes, I was on the look out for as many good pictures as I could find. 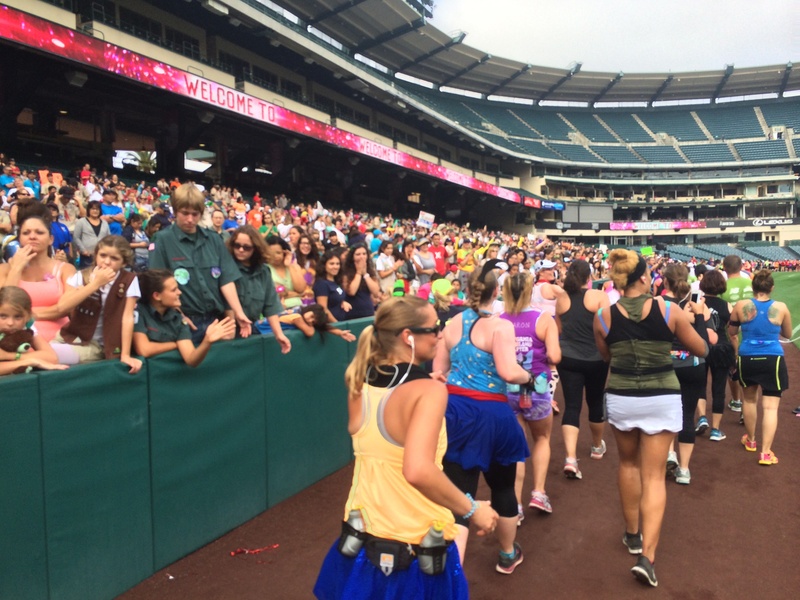 The Angels would play the A’s at 12:45pm, but, in the morning the Big A was all about the Disneyland Half Marathon and its runners! As I made my way up the third base side, they had a camera person and I saw myself on the jumbo tron! With all the people running around me, I couldn’t stop to get a picture of it. Oh well, You can’t get all the pictures. The picture above is a pretty sad one…we’re leaving the stadium. We made our way out of the stadium and wrapped around the outside. 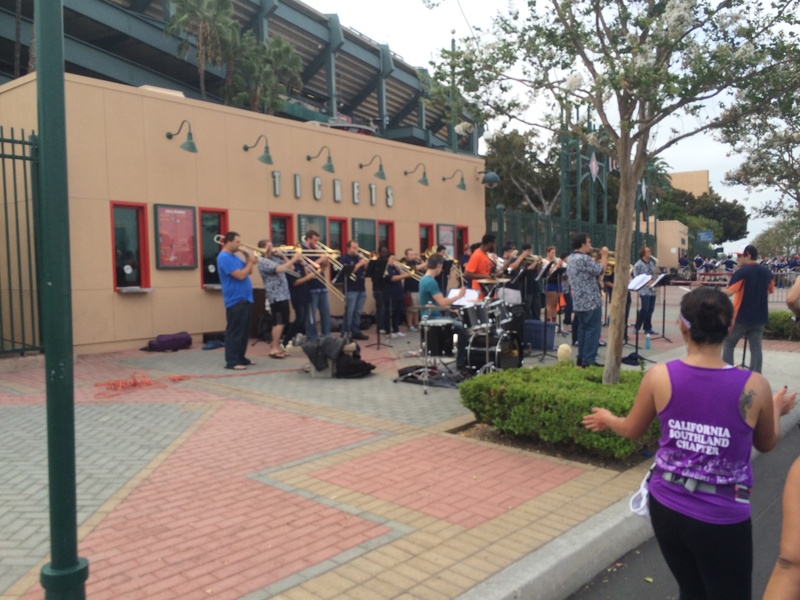 This is the first of two pep bands they had on the outside of the stadium to keep us going. As we curved up to go out of the parking lot, we were greeted by a few groups of cheer squads! 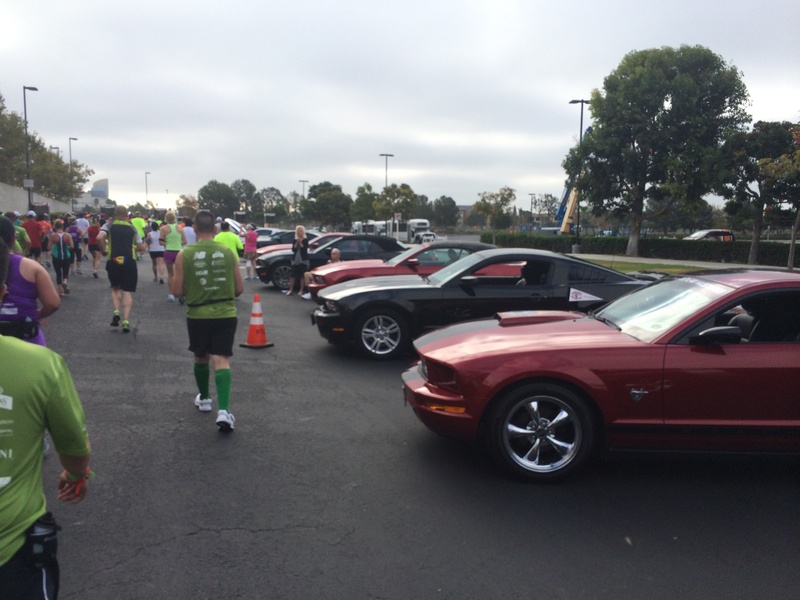 There was a water station as we got close to leaving the Angel Stadium parking lot. Okay, once you leave the parking lot, the course gets hard to deal with because there isn’t as much to distract you and the scenery isn’t all that great. 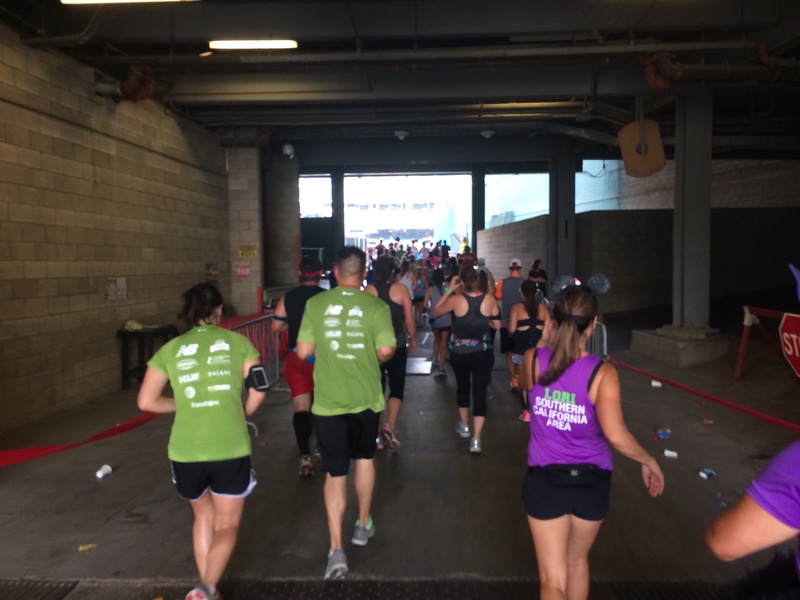 By the time I passed the 10 mile marker, I was thinking that I’d finish around 3 hours 15 minutes. So, I texted my wife to let her know what my expectations were. Since the sun had come out, it was nice to get any shade we could find. At this point, I was feeling tired. I tried listening to my tobyMac block of music. However, since I was so far behind my goal, I was working hard to keep my mood positive through this part of the course. The only thing to look forward to in this part is the finish. 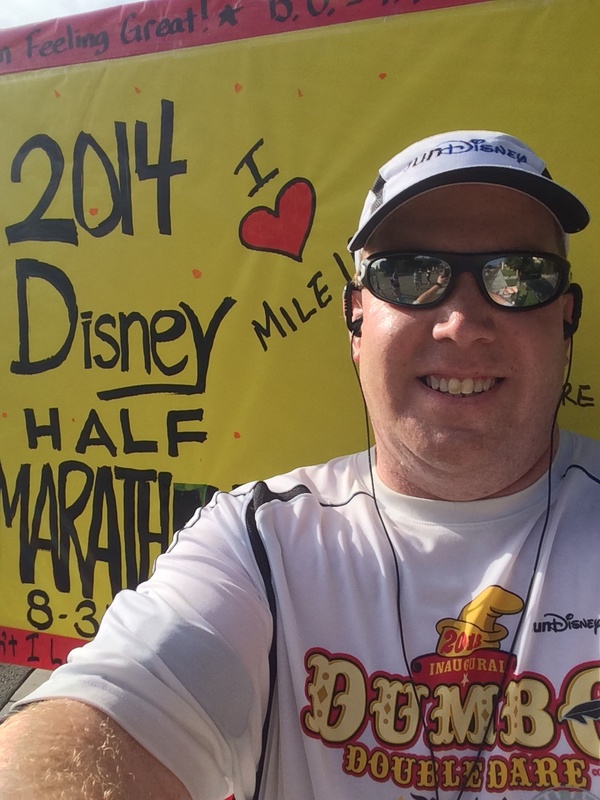 Somewhere around mile 11, someone posted this poster for you to take your Disneyland Half Marathon selfie. 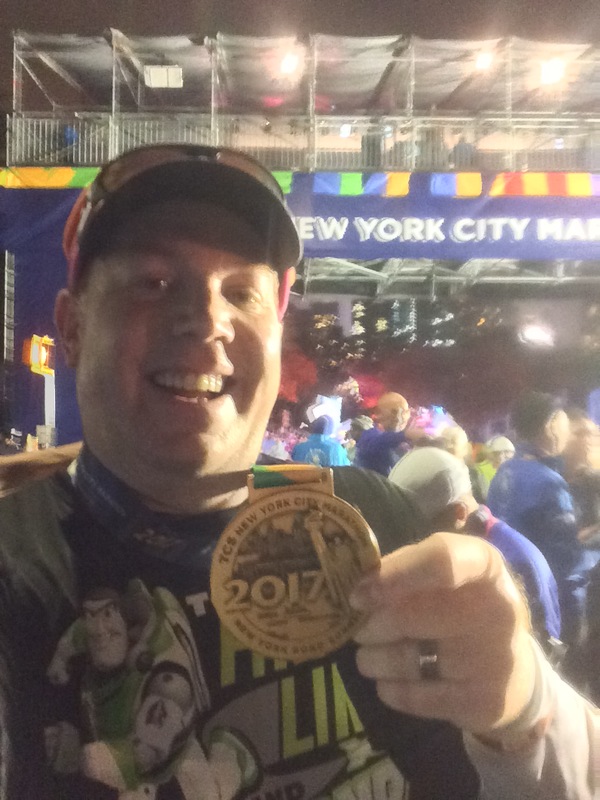 Since I was no longer chasing a time goal, I thought…why not? Shortly later, we came to our last area of shade until we got to the Disneyland Resort. The cheer squad here were really loud. 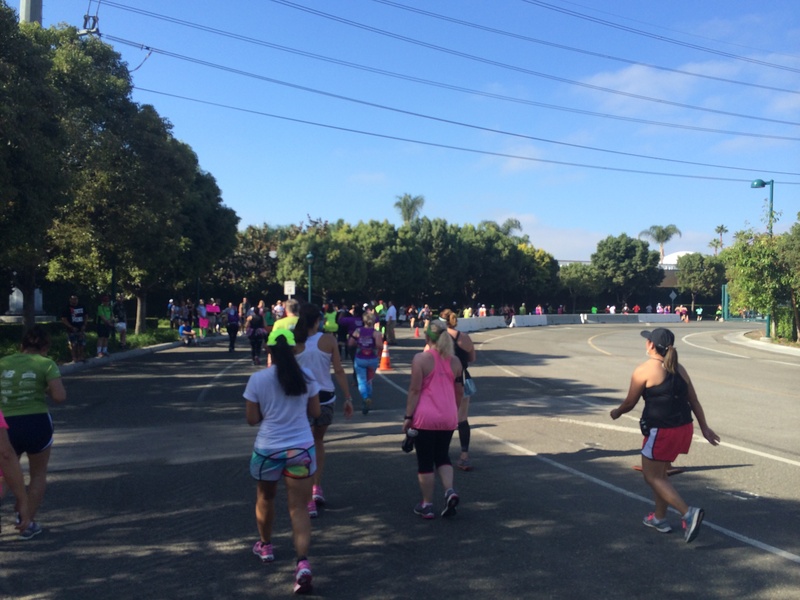 As we were in the shade, I felt motivated again to start-up the run/walk intervals and the music. Ah, the Tower of Terror is in the distance! We’re almost to the end of the 12th mile! By this point, I started thinking I might be faster than 3 hours 15 minutes and started pushing to beat that time. 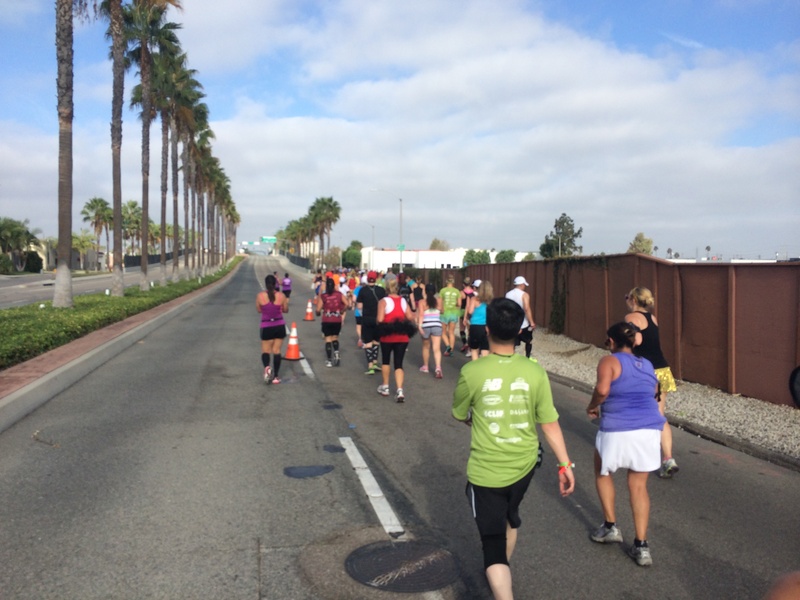 As we passed the 12 mile marker, I was hoping I might finish faster than the OC Half Marathon. I was back to running my intervals and was excited again. 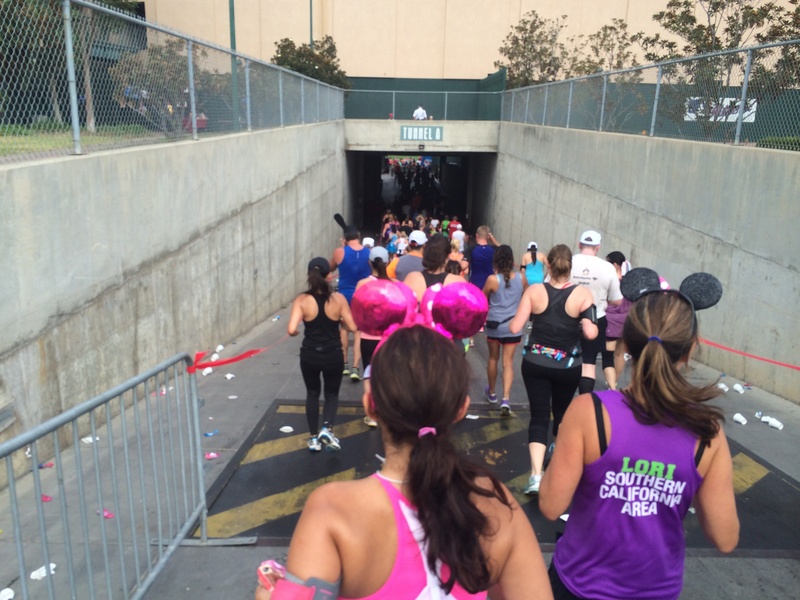 As we exited DCA’s backstage area, i could feel the finish line getting closer. The Disneyland Hotel! The finish is getting so close! At this point, I was thinking about looking good for my wife who would be somewhere around the Mile 13 marker. So, I skipped a run interval. Also, by this point, I was getting a little emotional. 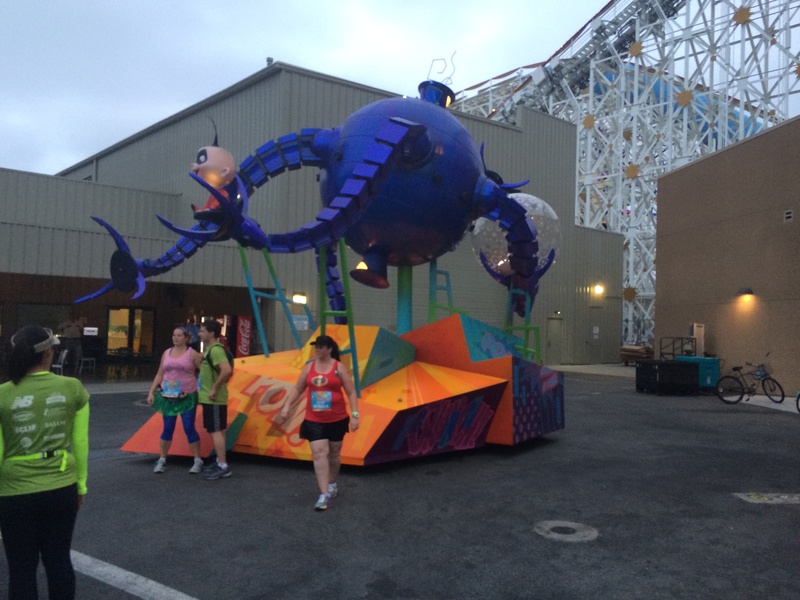 The Dumbo Double Dare was almost finished. 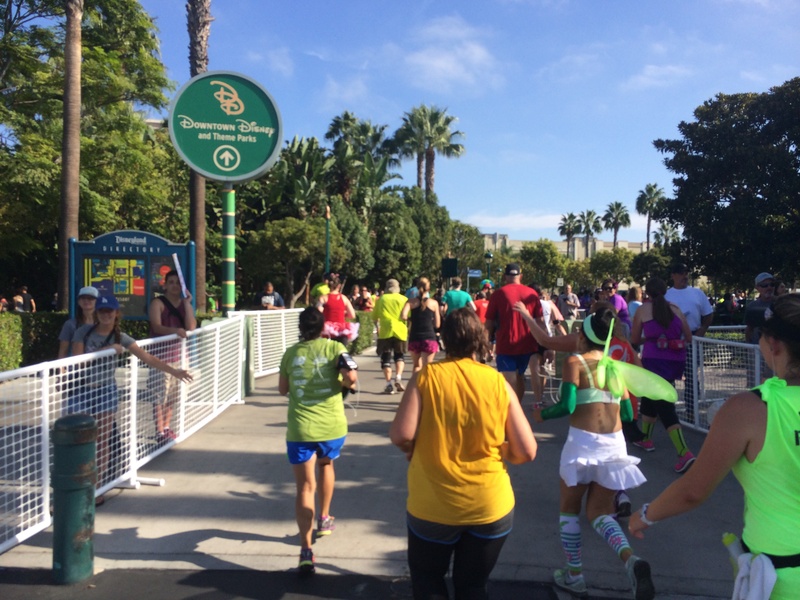 As we got to the road that runs between Downtown Disney and the Disneyland Hotel, I knew this would end up being my slowest half marathon yet. 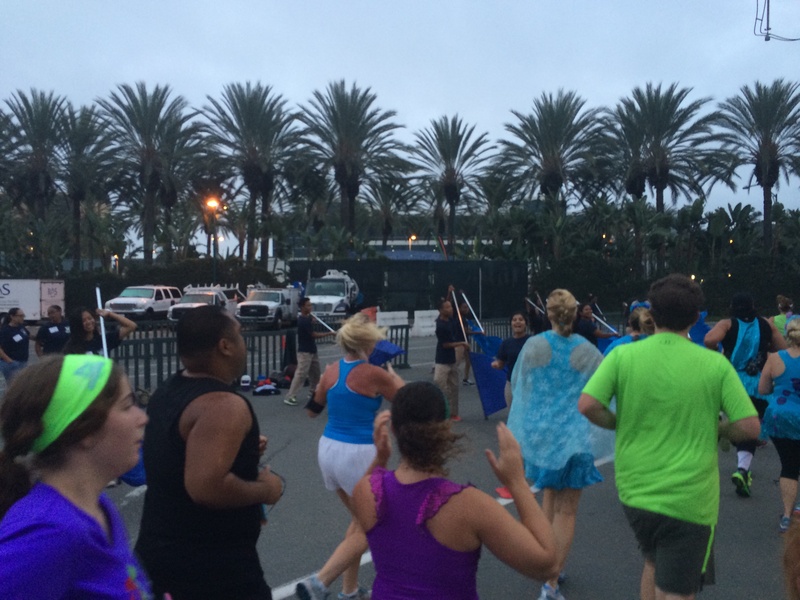 However, unlike the OC Half Marathon, I was feeling amazing! 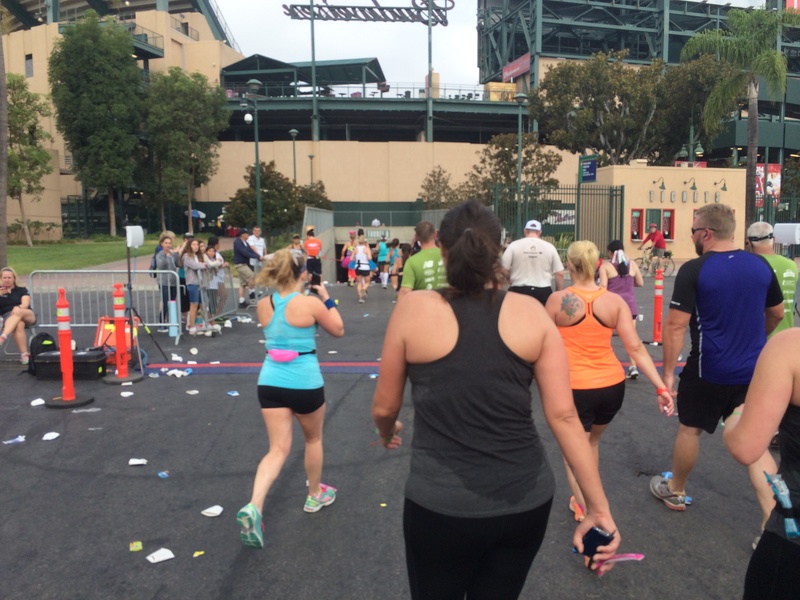 As I approached the end of the 13th mile, my wife was there to capture the moment. Here I come! I was really happy to see her! I was also really happy to see that 13 mile marker! Just past my wife, I saw the finish line! I did take a few second walk break to gear up for that final push to the finish. 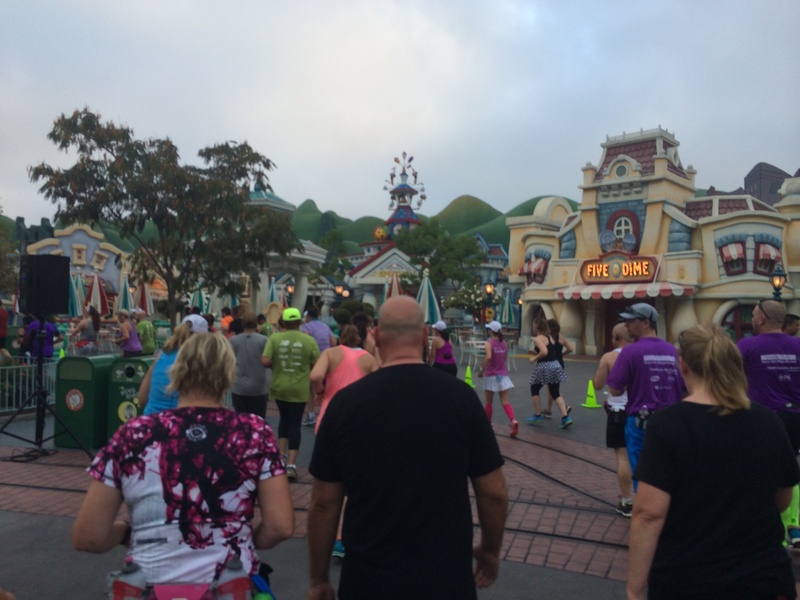 As I approached the finish line, I scouted the area to see which characters were out and about. I saw Pluto and Mickey on one side and Goofy on the other. I chose to head towards Pluto. I gave him a high-five and Mickey a high-five. Unfortunately, this year, Marathonfoto didn’t get it on film. Oh well. 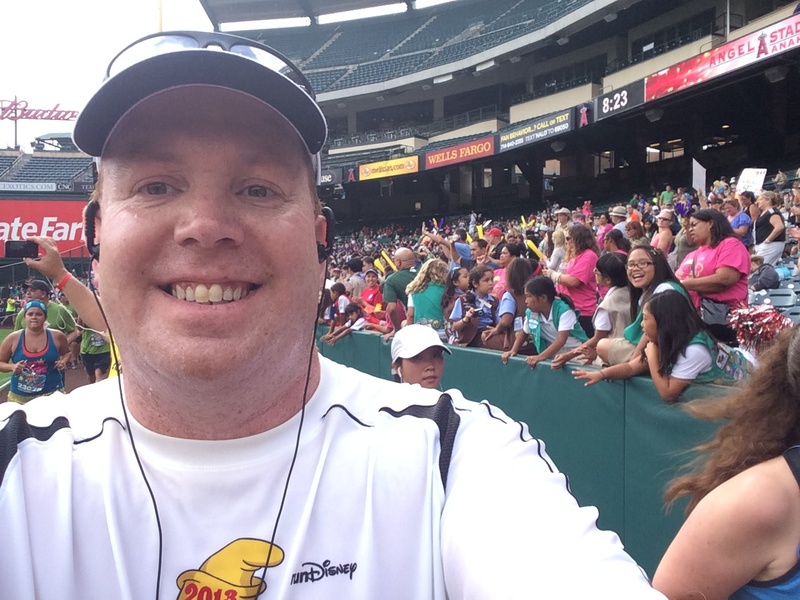 Just like that, 3 hours, 12 minutes, and 50 seconds after it began (30 seconds slower than the OC Half Marathon), my Disneyland Half Marathon was finished! 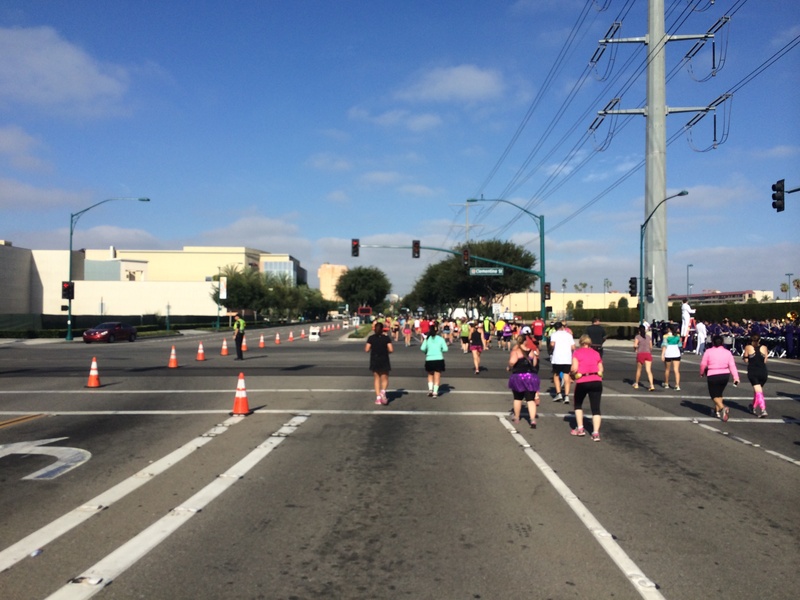 Again, unlike the OC Half Marathon, I was happy because I had fun while getting this slow time! Plus, it was still faster than I thought it would be at the 9 mile mark. 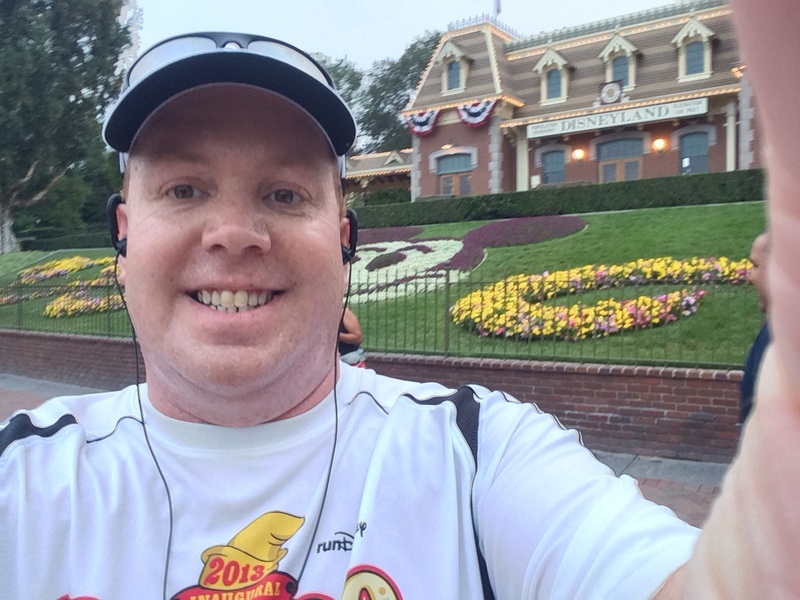 After taking the finishing picture, I headed off to get my Disneyland Half Marathon finishers medal! 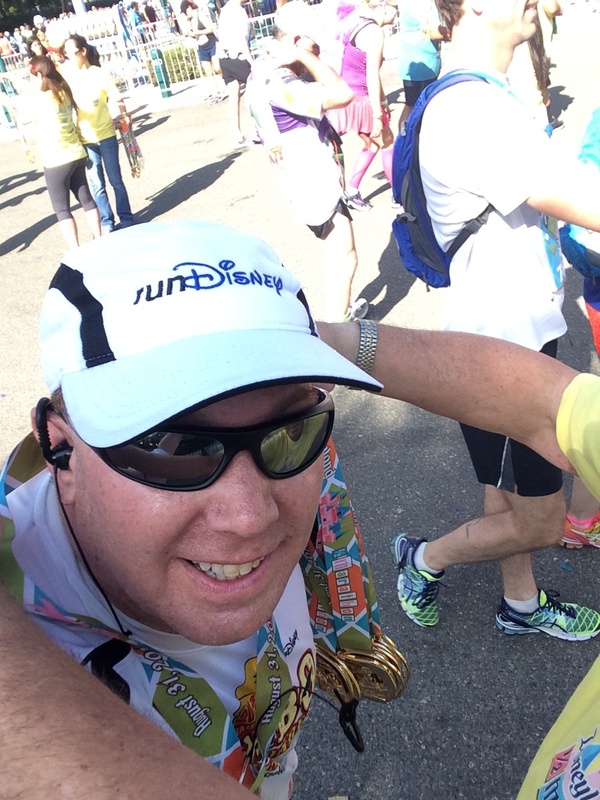 The guy giving me my medal thought it was funny that I was taking a selfie of the moment. 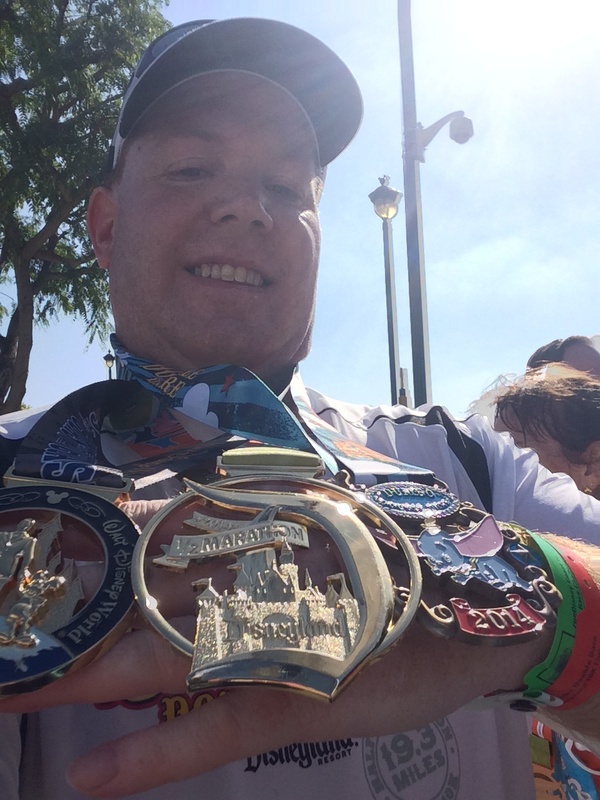 Then, it was off to get my other two medals. 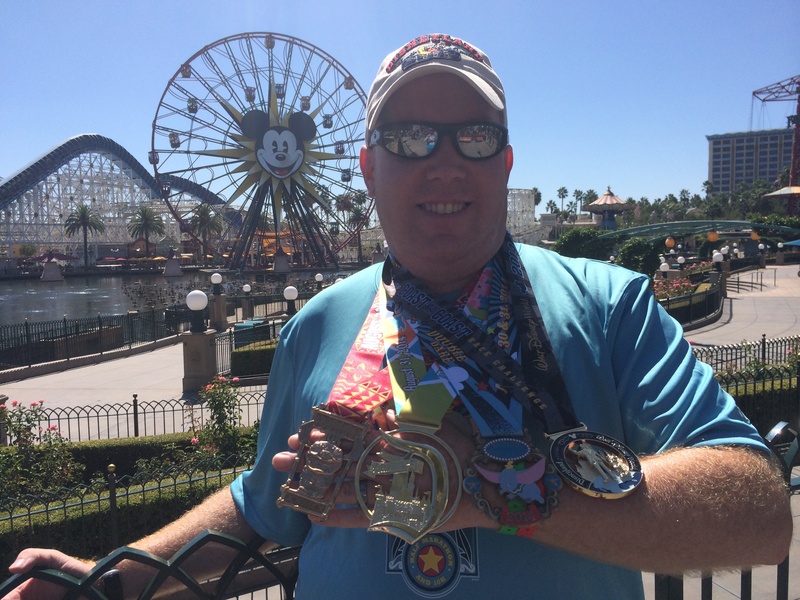 I still had to collect the Coast to Coast medal and Dumbo Double Dare medal. I was finally getting these glorious medals this year! I had to enjoy this moment as much as possible. 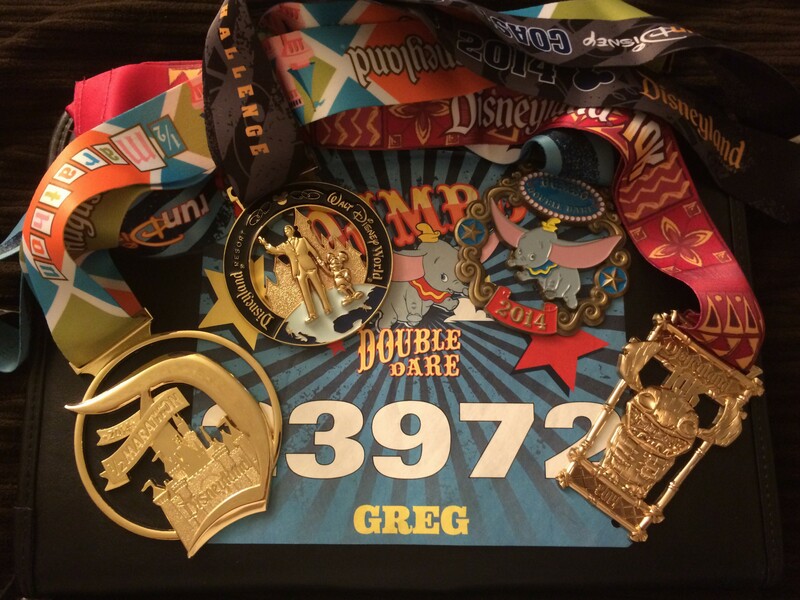 The Dumbo Double Dare medal was earned by running in the Disneyland 10K the day before and the Disneyland Half Marathon. 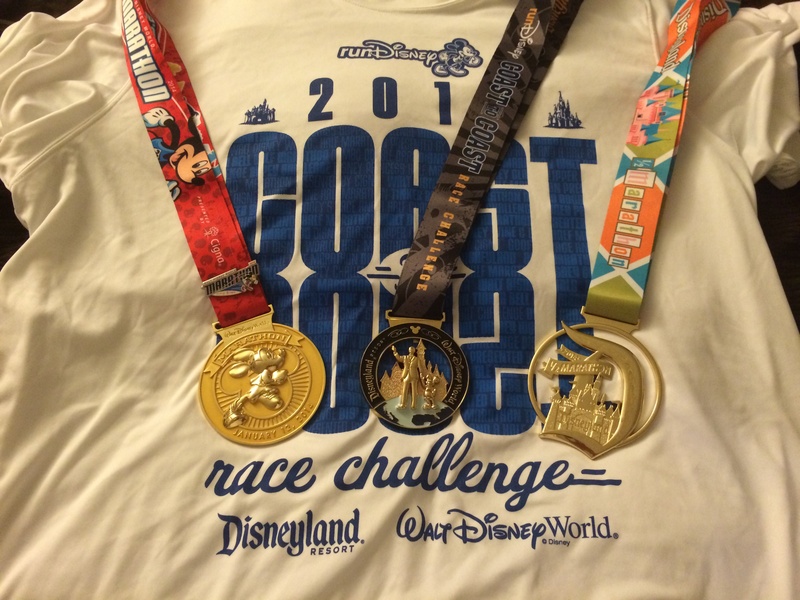 The Coast to Coast medal was earned by running the Walt Disney World Marathon this past January and the Disneyland Half Marathon. Yes, the medals were well-earned! to soak in the pool. 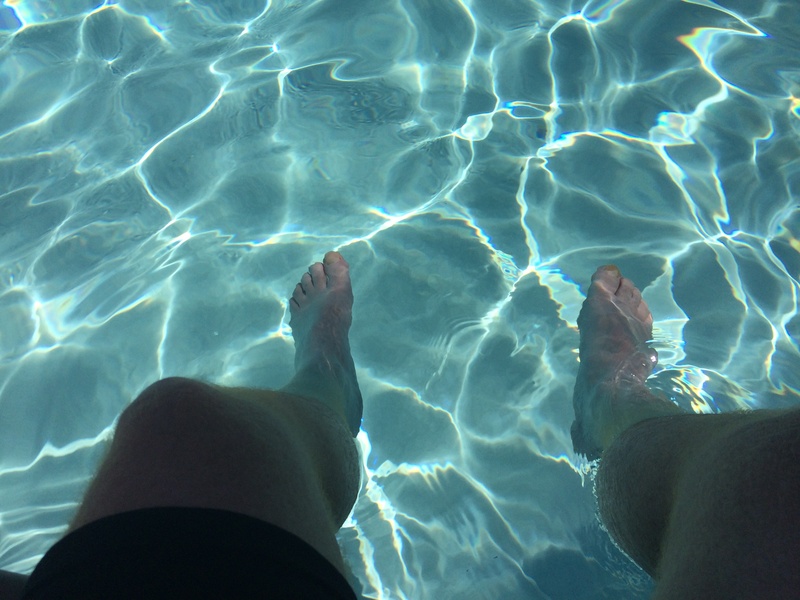 Let me tell you, it was heaven on earth to be sitting there at the pool! 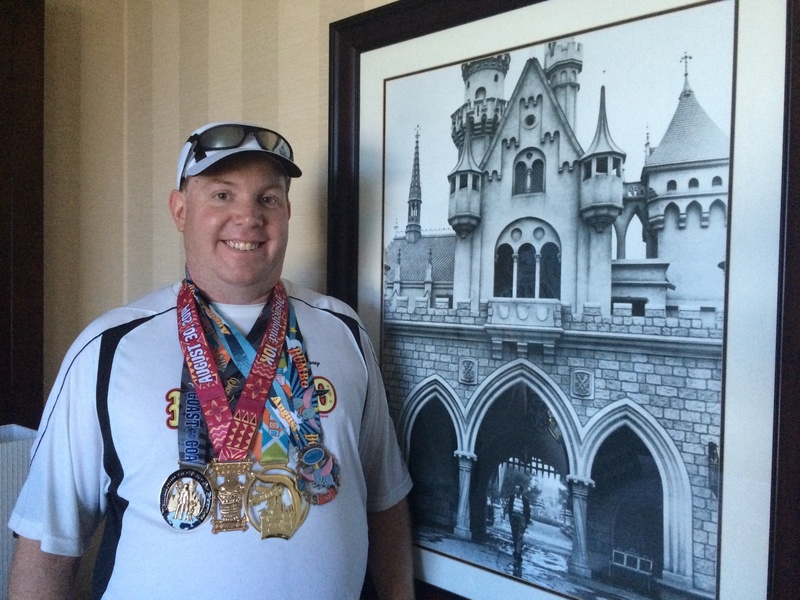 I was an official Dumbo Double Dare finisher, Disneyland Half Marathon finisher, and Disneyland 10K finisher! I had to post in the room with that famous picture of Walt dream walking through Disneyland. 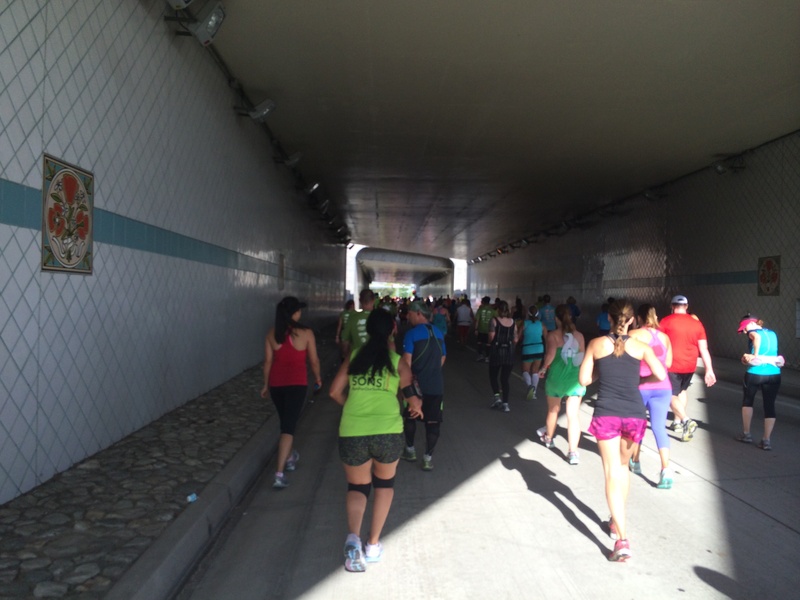 What an amazing weekend of running! 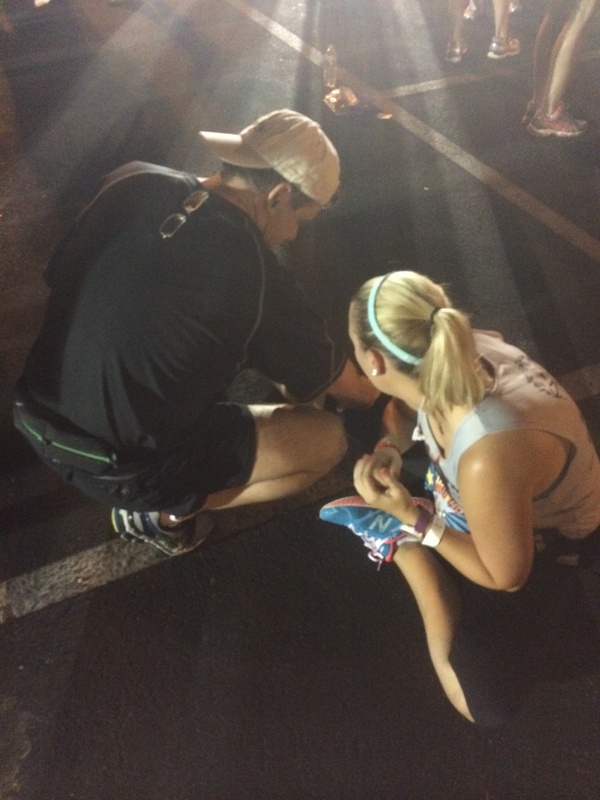 Not every race will be a PR. So, when you can’t run fast, you might as well have fun with it and celebrate the mere fact that you can finish the entire distance. Whether that’s 1 mile, 5K, 10K, 13.1 miles, or a full 26.2 mile marathon (or more), it’s all a gift from God to be able to do so. Go out there and celebrate it! Have fun! There will always be other races for PR’s. 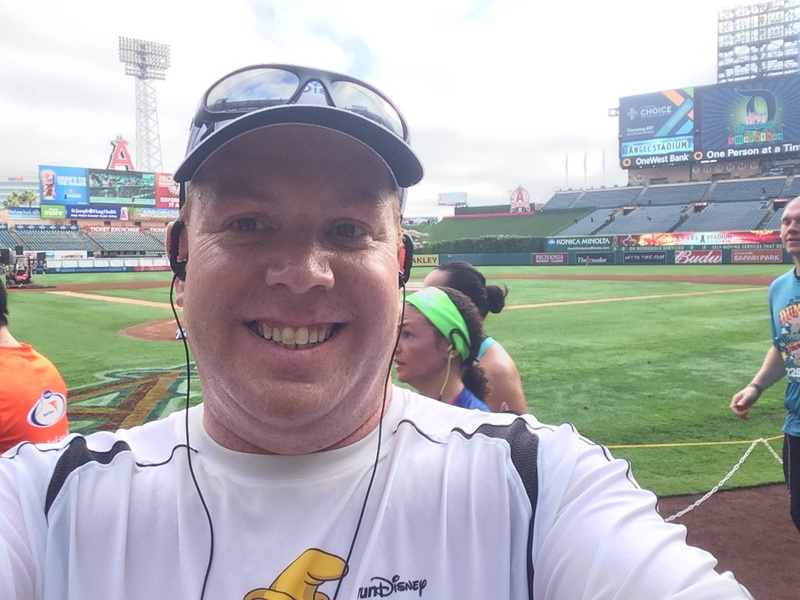 I loved running the Disneyland Half Marathon this year and proud of myself for not letting the finish time get me down. I had a blast and will shoot for a half marathon PR another time! 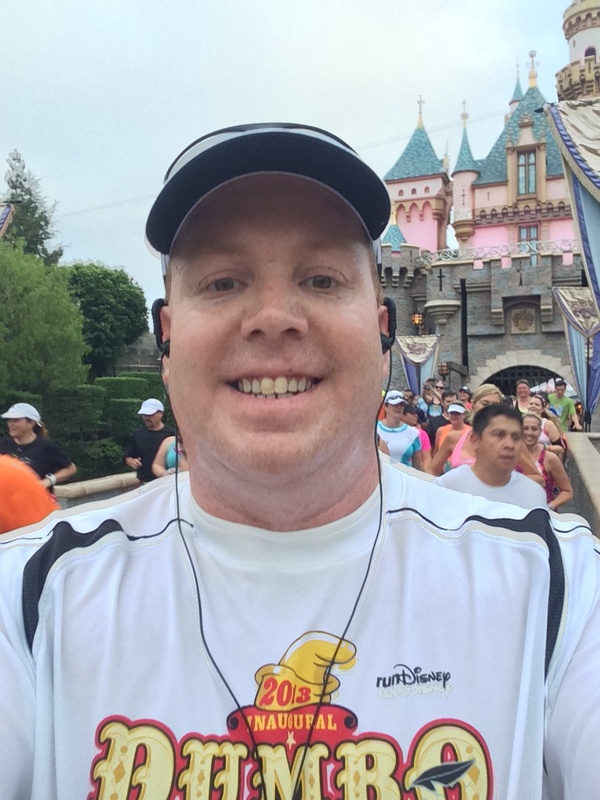 Next week, I’ll share some more about the Disneyland Half Marathon Weekend trip. 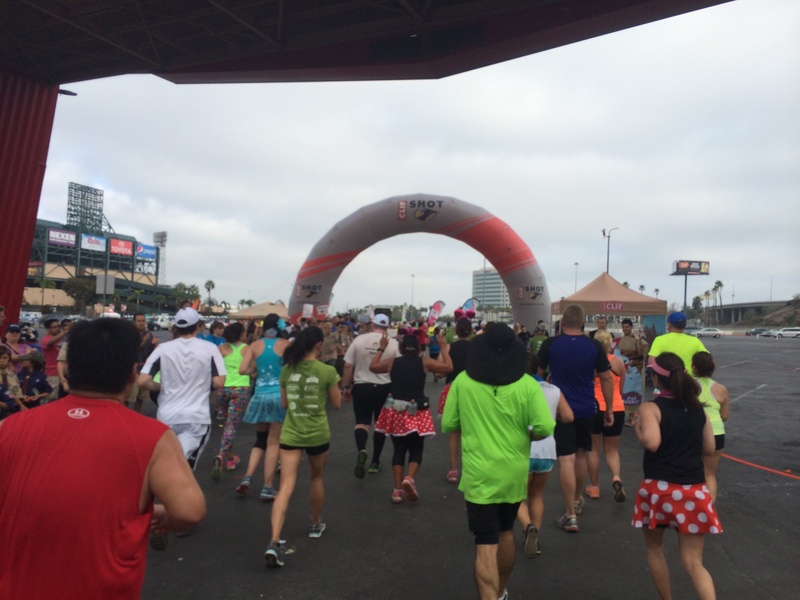 It was a mini race-cation for me and my wife. We did stay at the Disneyland Hotel after all. So, tune back in next week as I share about our time at the hotel and celebrating after both races. It was an absolutely magical weekend for both Brooke and myself. I can’t wait to share the rest! Have a great weekend! See you again on Monday! 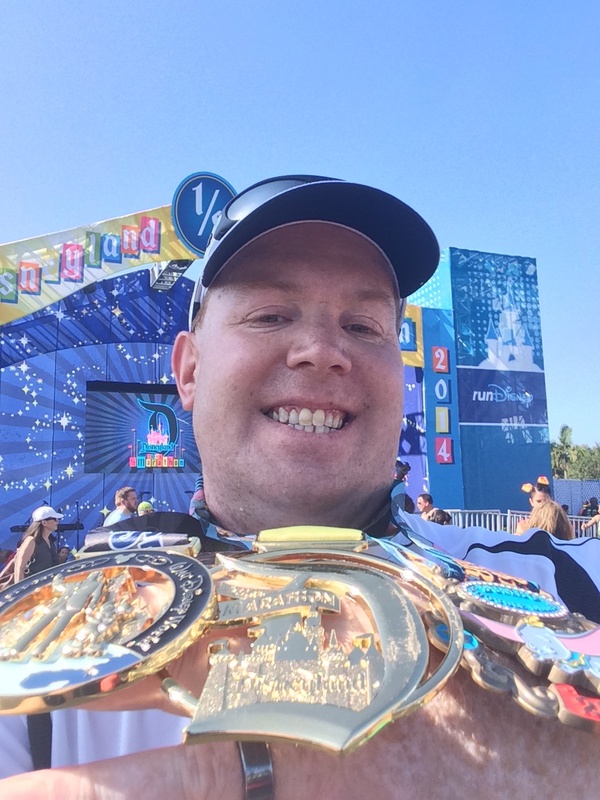 Having Fun with My New runDisney Bling! I’m glad you made it fun! 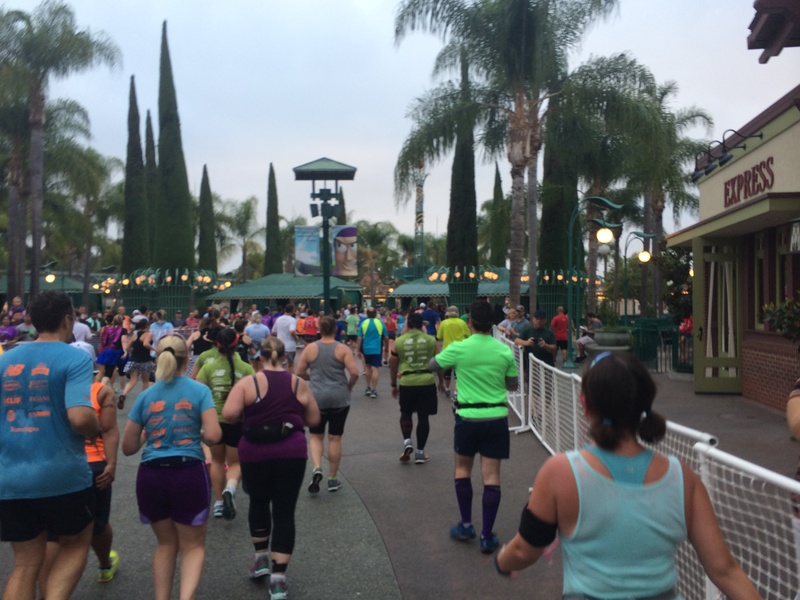 That’s what Disney races are for, fun! 🙂 Congrats on such a great accomplishment! Thanks! You’re right. 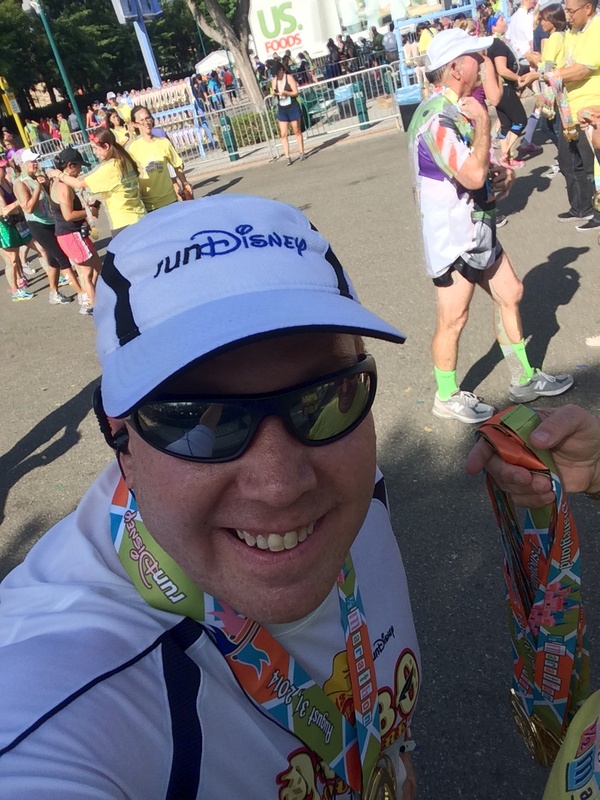 Disney races are for fun and I had lots of that! I totally get the PR mentality. 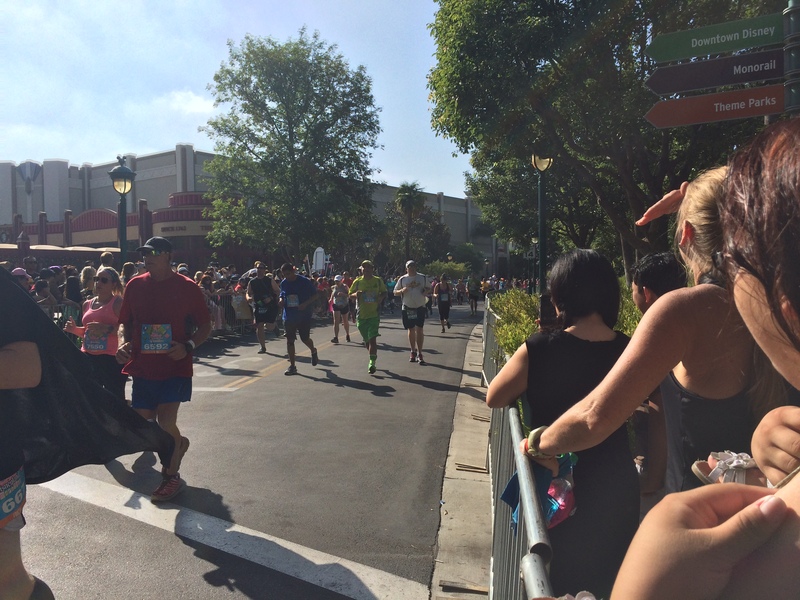 I had my worst finish ever – 3:30, but my mom had a great first race and we had a great time – both seeing our favorite characters. 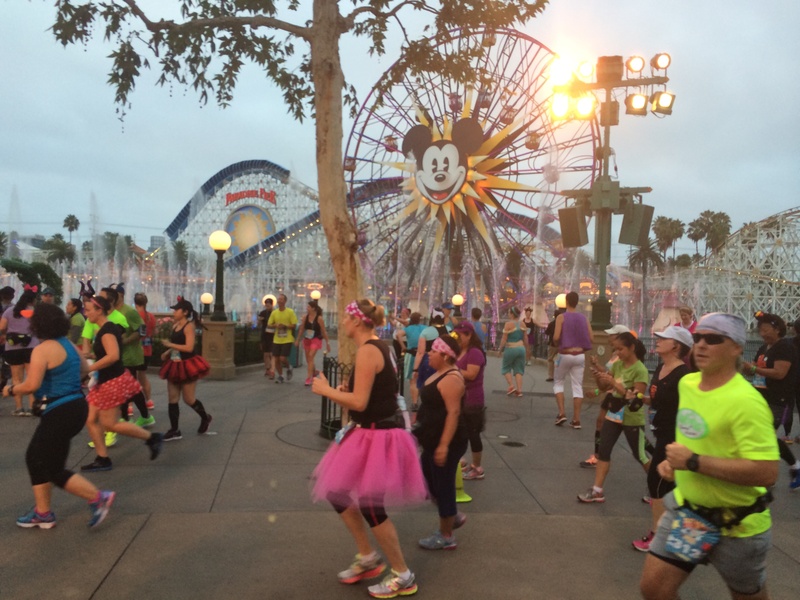 I think it is especially important to remember to have fun and not worry about your time for disney races. there is just too many people, too much stuff to see and too much fun to be had. congrats again! I agree. 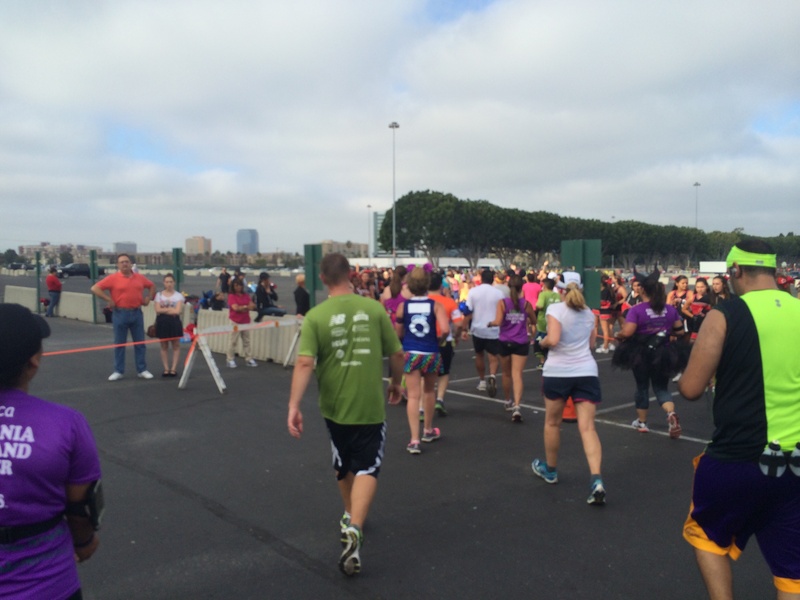 Congrats to your mom on her first race! Great recap! 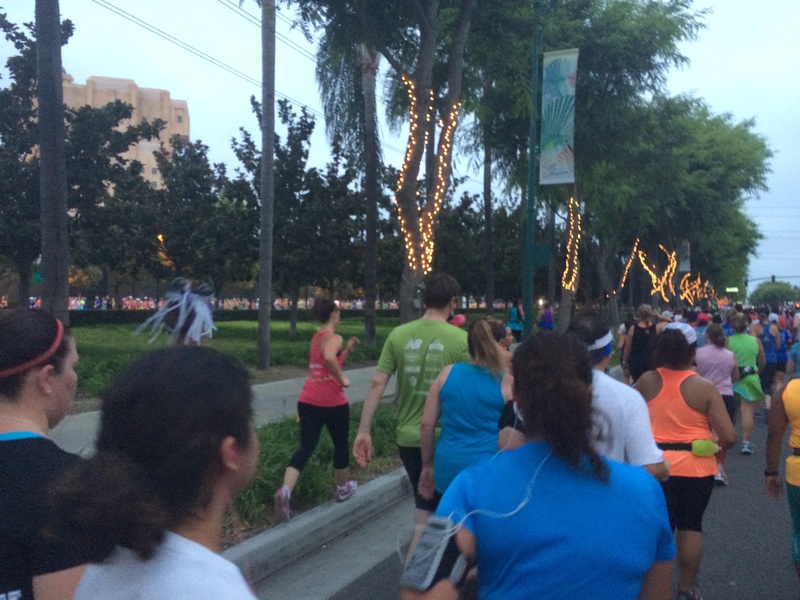 The weather and humidity made it so tough to go after time goals (I wanted under 3 hours but ended up in 3:04). 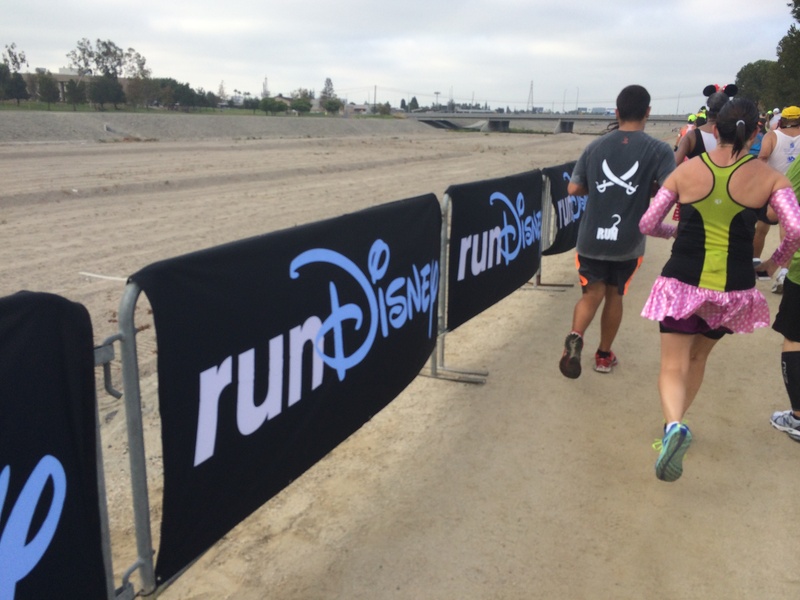 What I started doing was keeping regular race times and also disney race times so I don’t feel as much pressure to run for time. It ha a really helped! 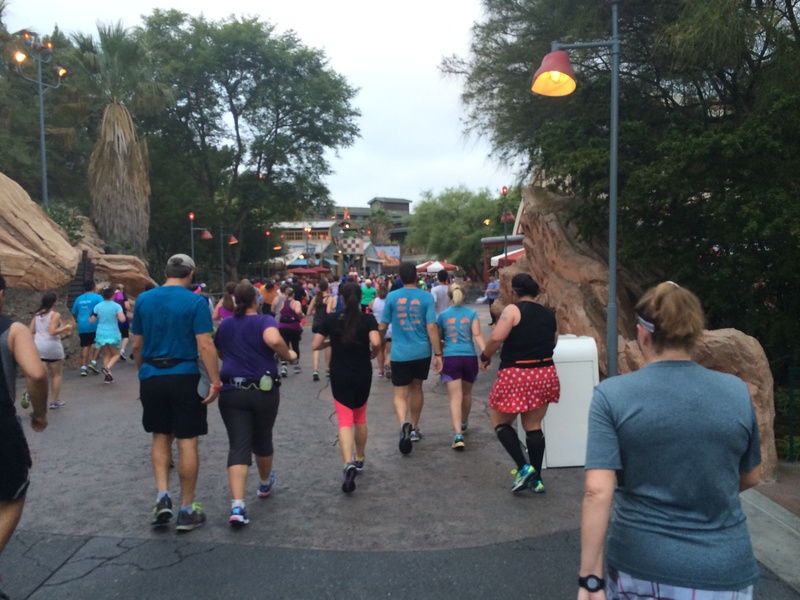 Keeping regular PR’s and Disney PR’s sounds like a great idea! I think I should do the same. Love that idea! It was great to have time to chat with you over the race weekend and not just the quick hello’s over a run.